All the photos were taken in our garden. 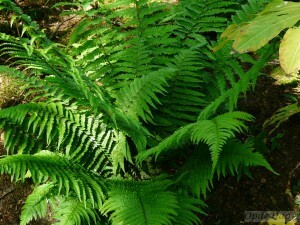 Alhough we don’t have a fernery as such, we are gathering a collection of ferns. 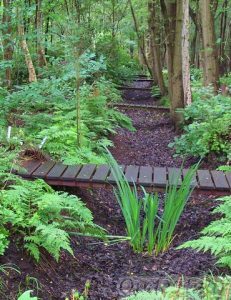 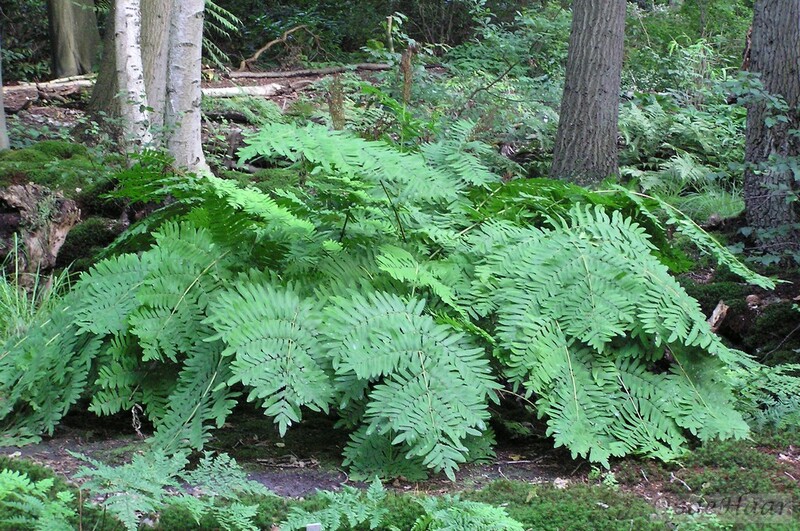 It will immediately be apparent to any visitor that our ground in the woods and in the Millennium garden is suited to ferns. 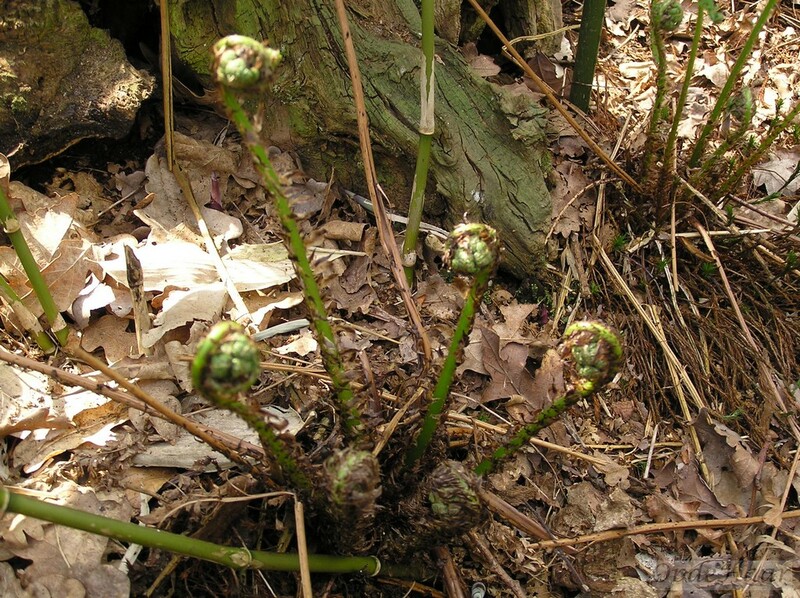 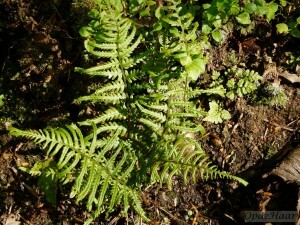 In fact, Broad Buckler fern Dryopteris dilatata almost reaches weed status as its spores germinate freely. 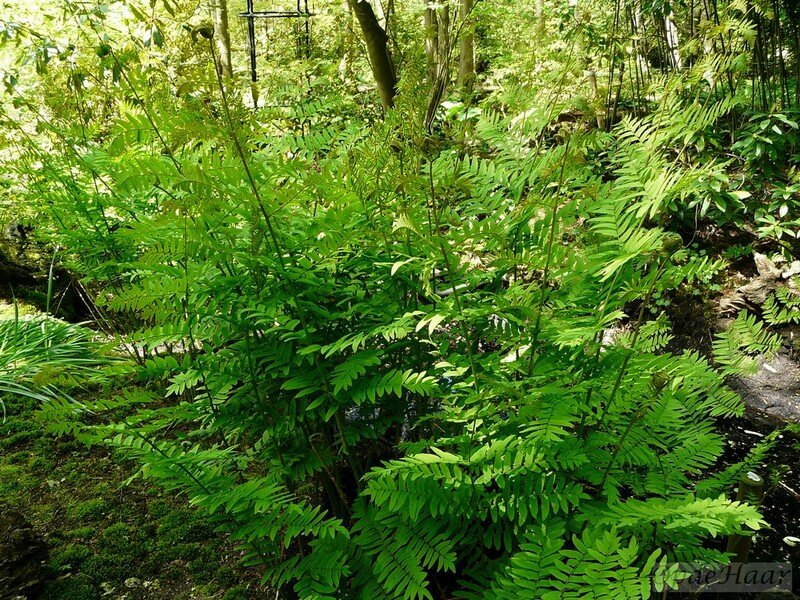 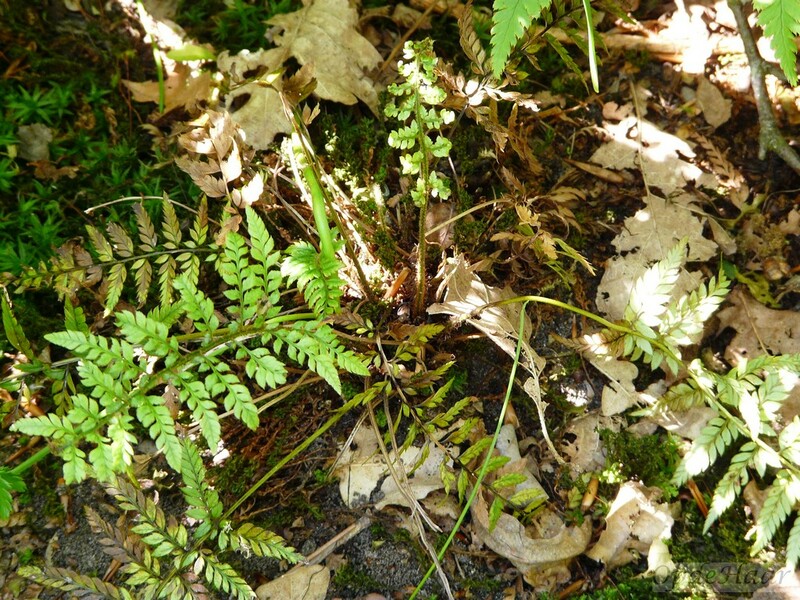 The royal fern (Osmunda regalis) is our largest native fern and several clumps existed when we came here and they continue to appear spontaneously throughout the woods. 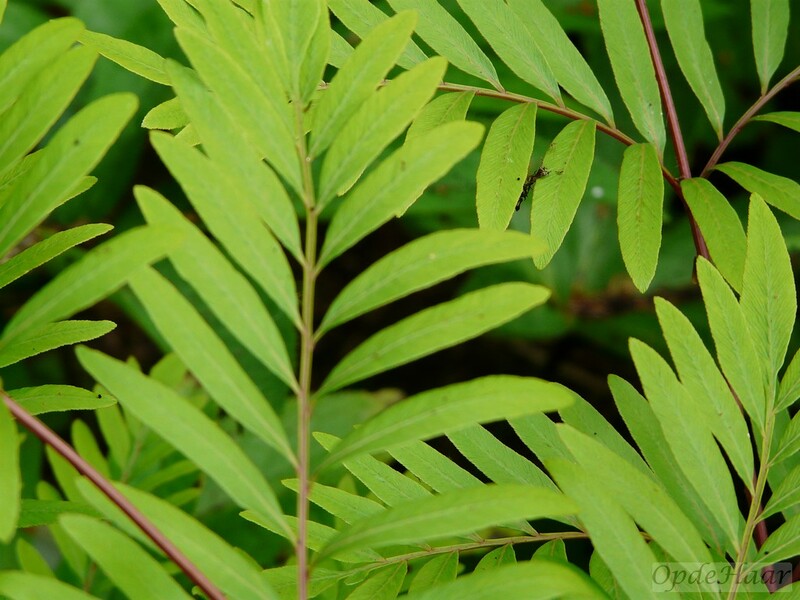 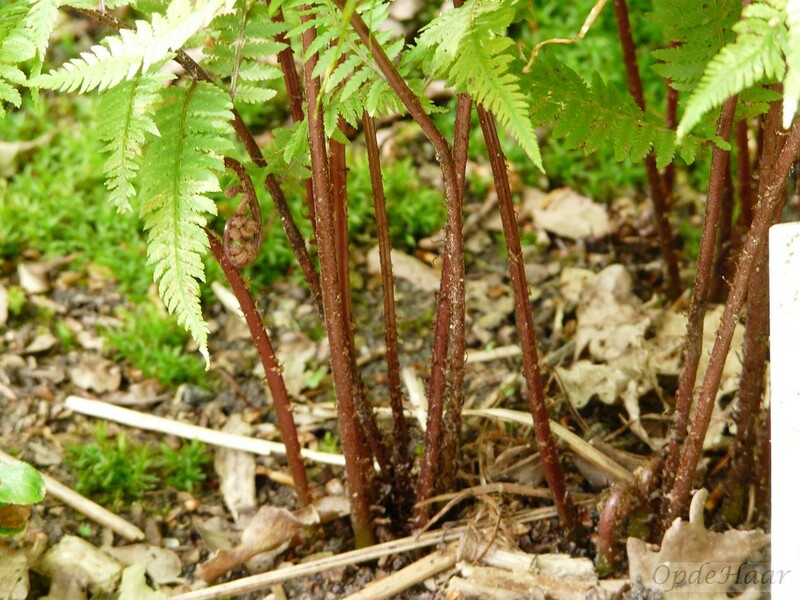 We planted Osmunda regalis purpurescens which has purple juvenile stems, as a variant of this species. 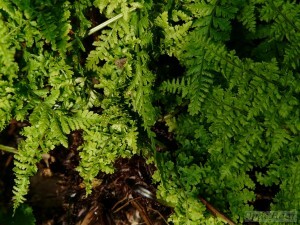 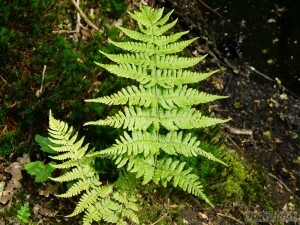 Most of the ferns other than the common Male fern and the more delicate Lady fern (Athyrium filix-femina) are labelled. 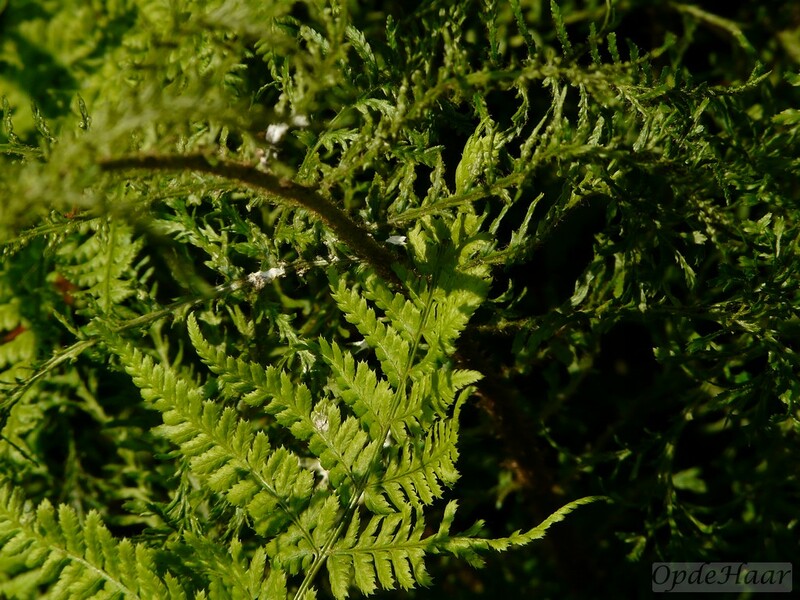 The Lady fern is spreading notably along the banks of the ditch that separates our property from that of the Geldersch Landschap on the western boundary of the wood. 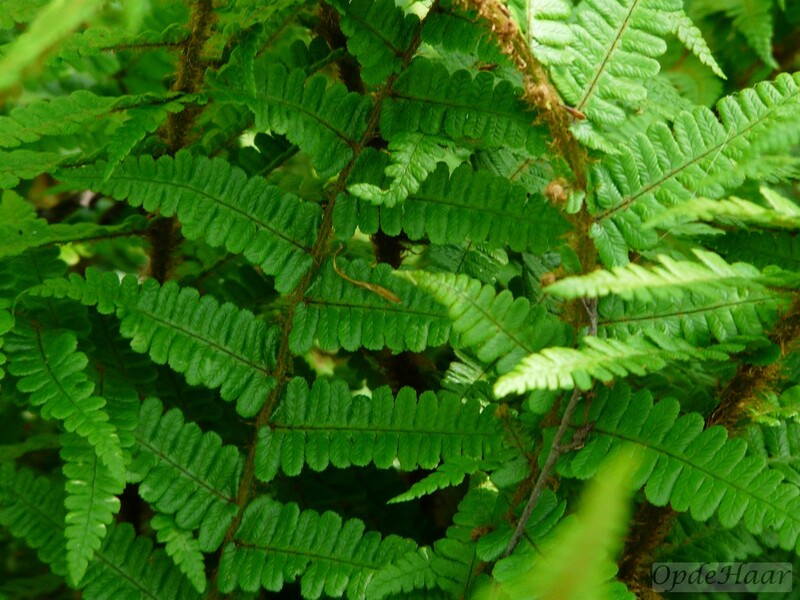 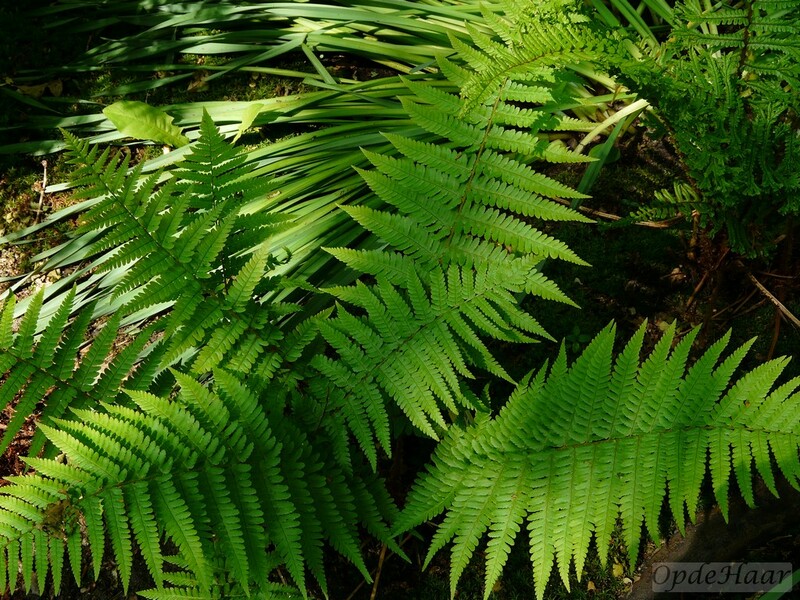 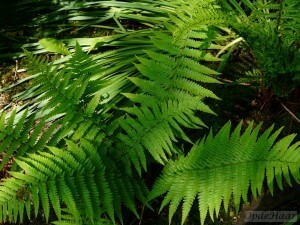 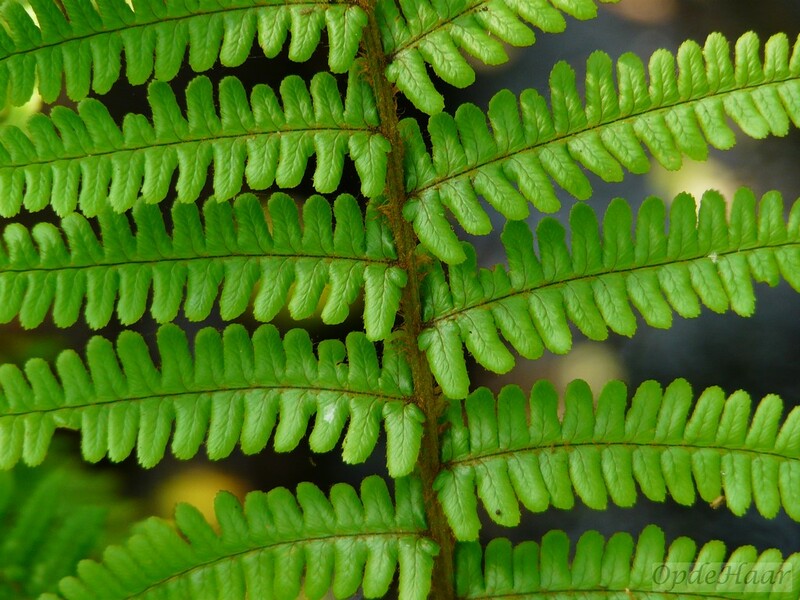 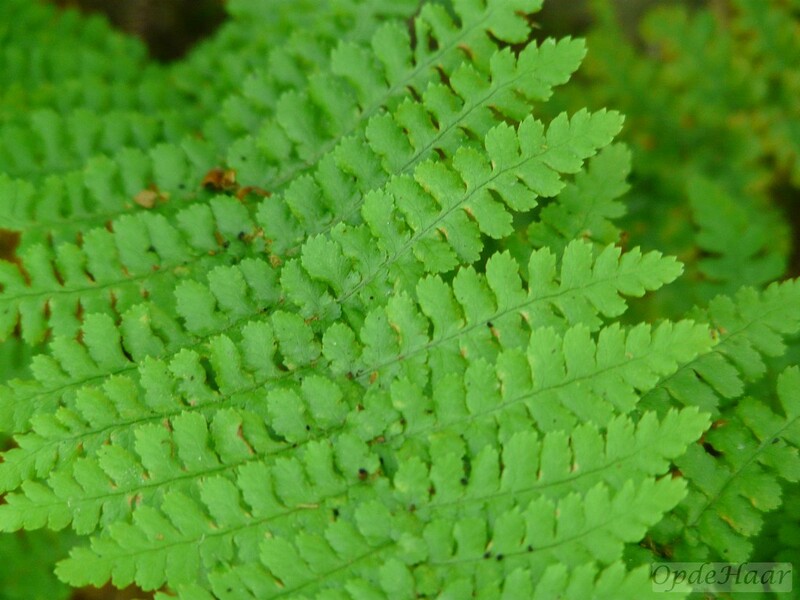 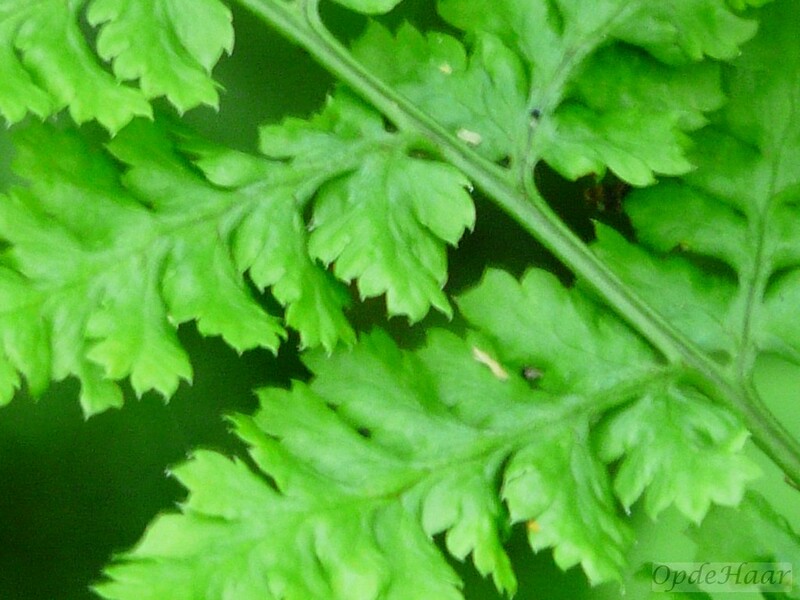 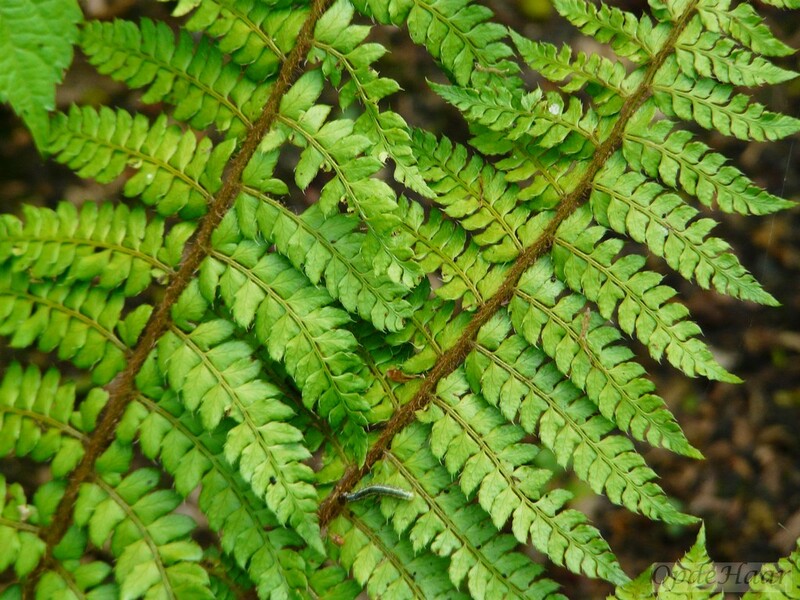 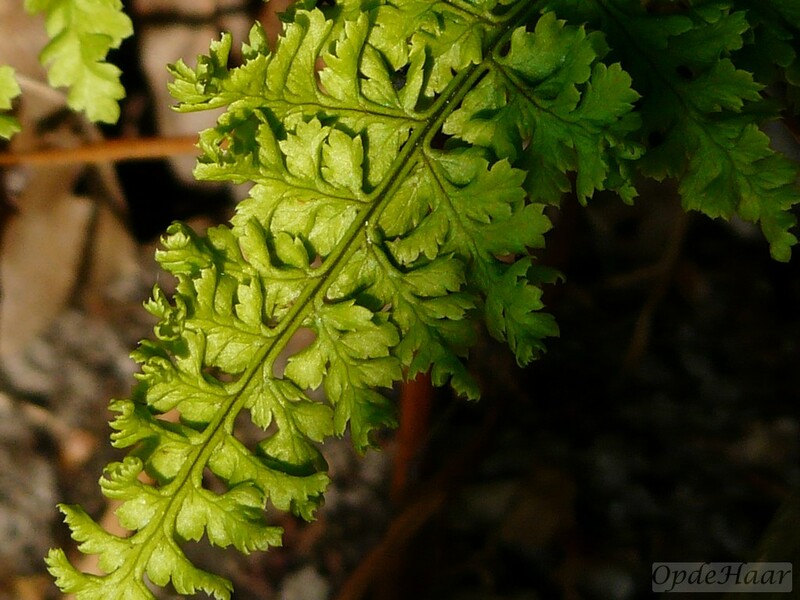 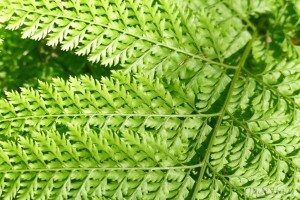 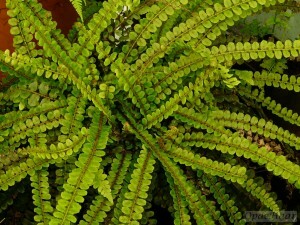 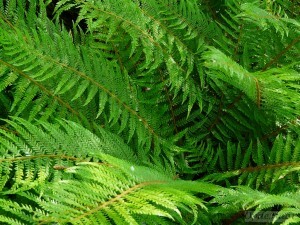 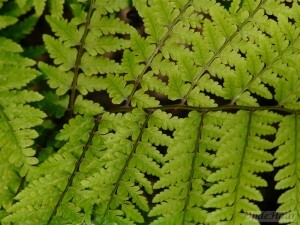 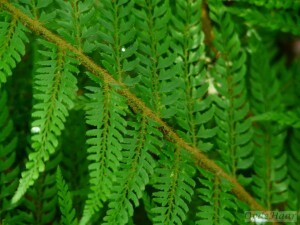 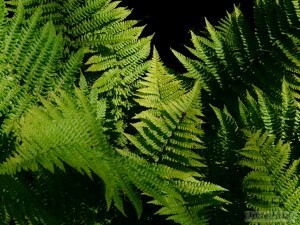 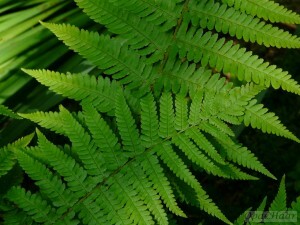 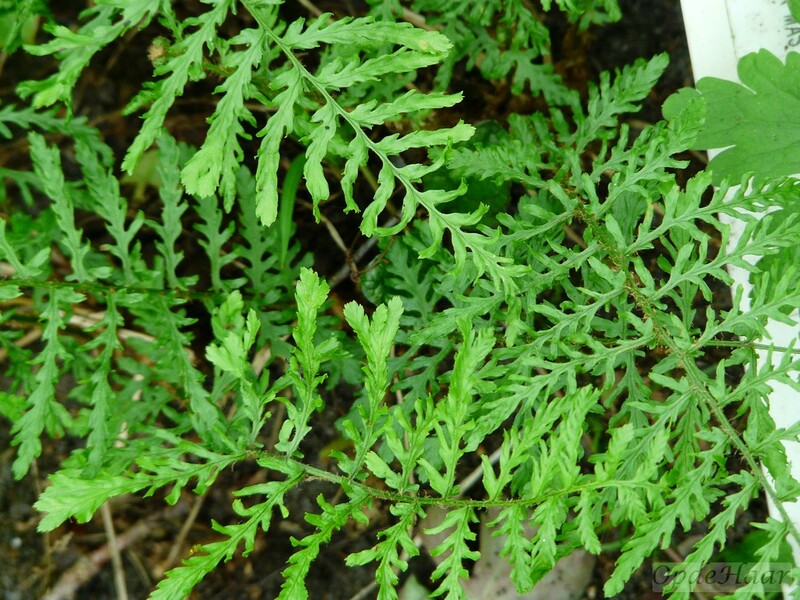 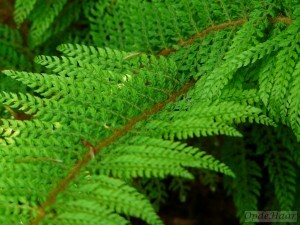 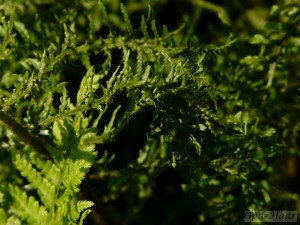 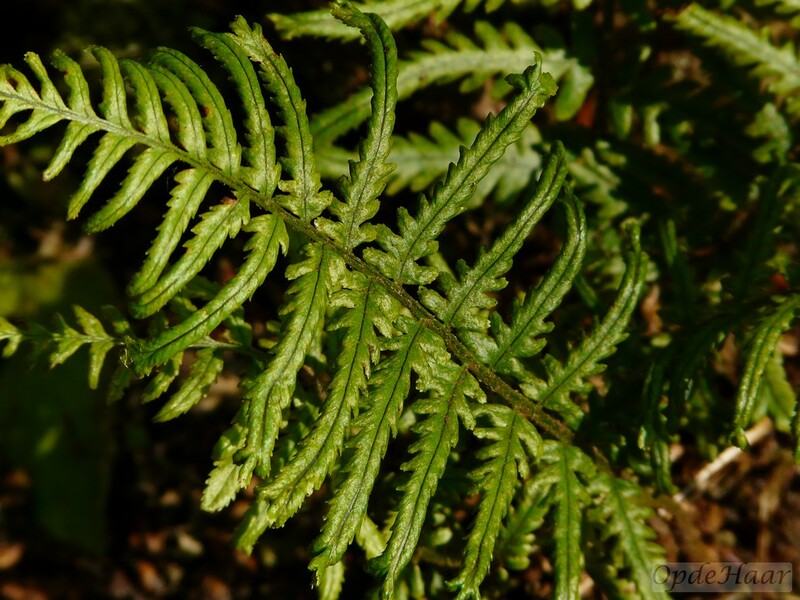 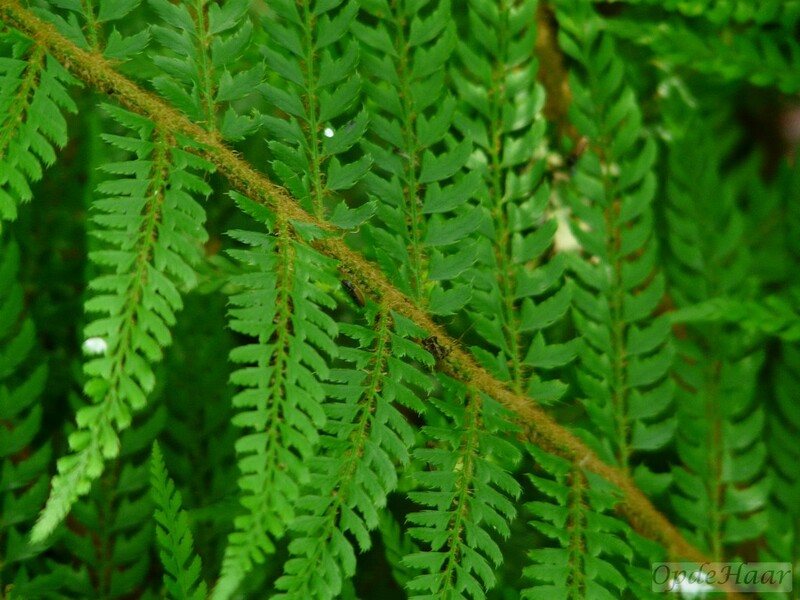 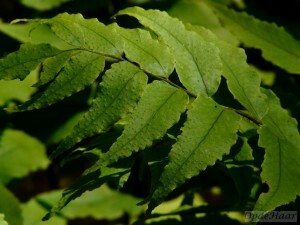 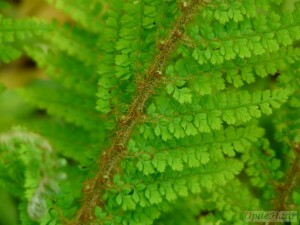 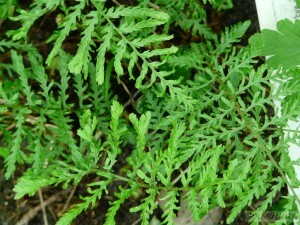 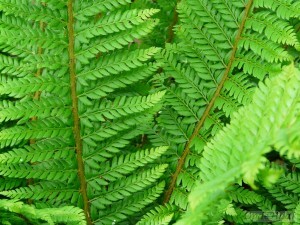 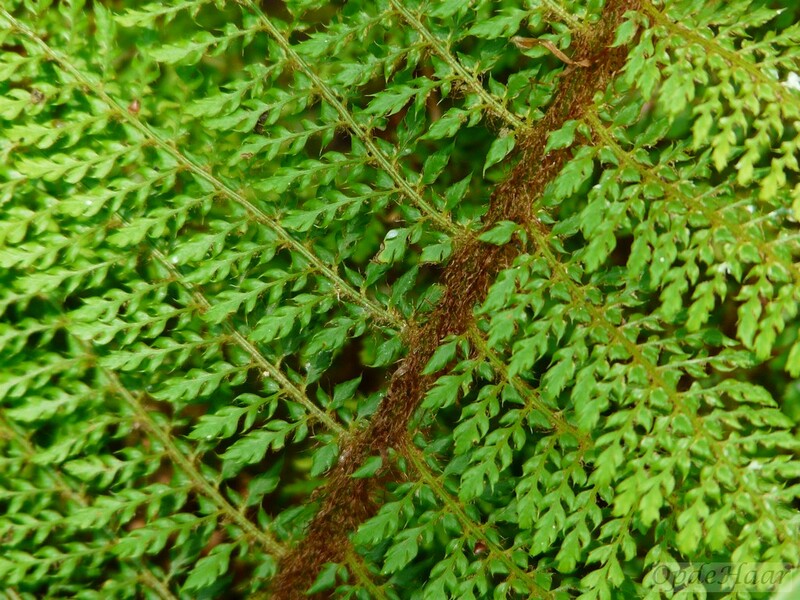 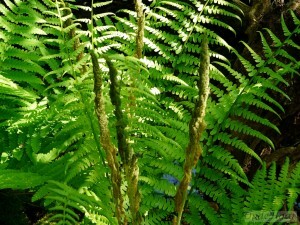 It is readily identifiable by its lighter green and more finely structure fronds. Asplenium is a genus of about 700 species of ferns. 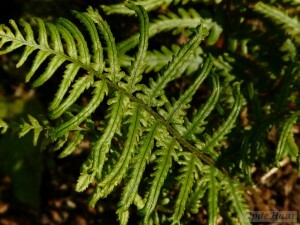 The most common vernacular name is spleenworts, applied to the more “typical” species. 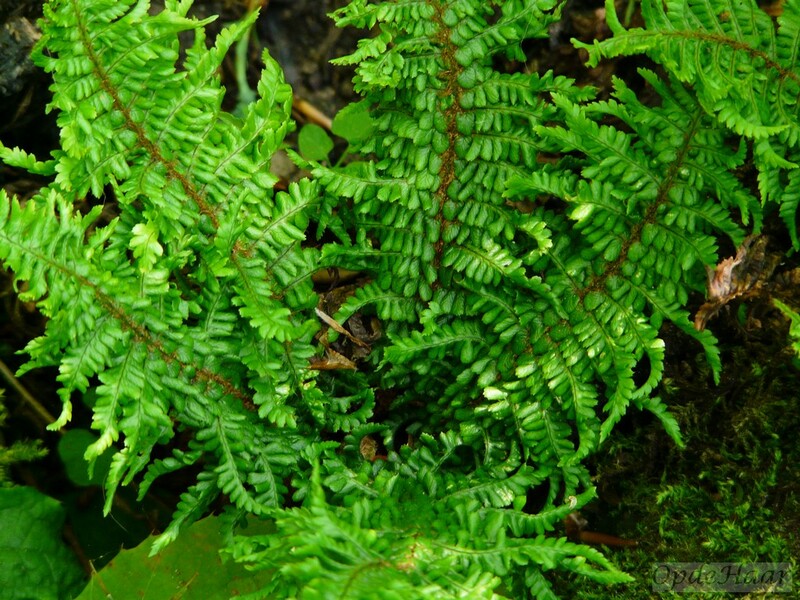 It is the largest (and some people think) it is the only species of the spleenwort family. 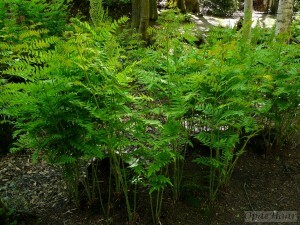 There are very small varieties and also very large varieties with plain fronds growing from a rhizome. 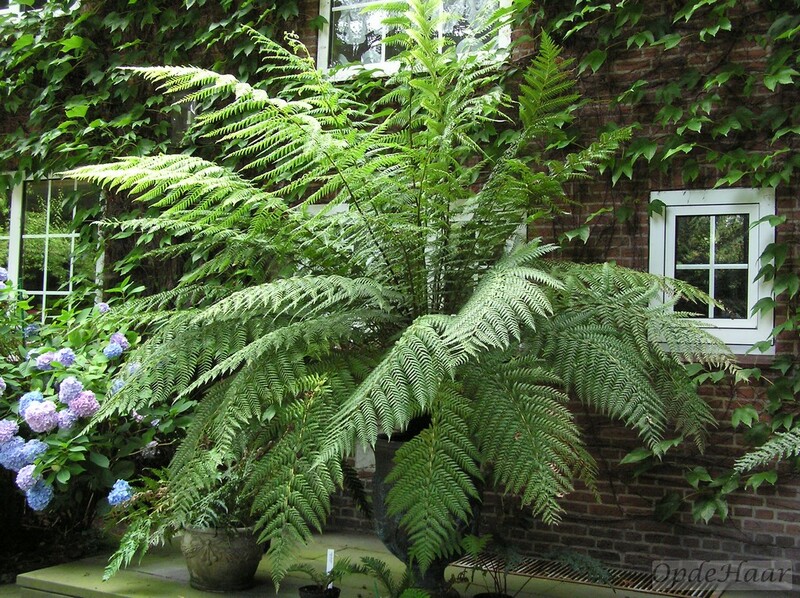 There are also tropical forms and small wall-ferns or rock-ferns, growing in cold and temperate climates. Athyrium (lady-fern) is a genus of about 180 species of ferns with a wide distribution. 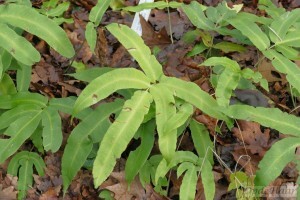 It is placed in the family Athyriaceae, in the order Polypodiales. 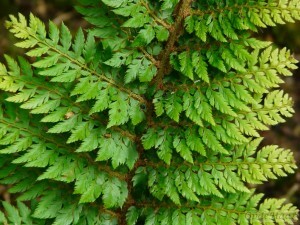 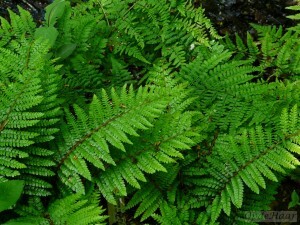 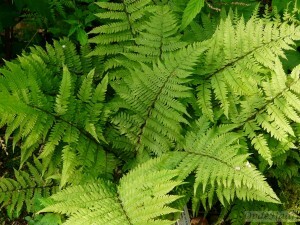 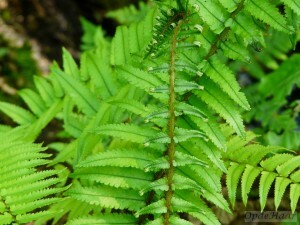 The common name “lady fern” refers in particular to the common lady fern, Athyrium filix-femina, which is a large, feathery fern native throughout most of the temperate Northern Hemisphere, where it is often abundant (one of the more common ferns) in damp, shady woodland environments and is often grown for decoration. Its common names “lady fern” and “female fern” refer to how its reproductive structures (sori) are concealed in an inconspicuous – deemed “female” – manner on the frond. 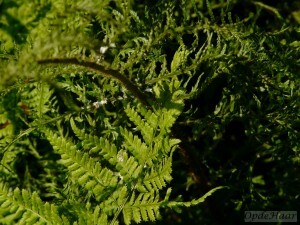 Alternatively, it is said to be feminine because of its elegant and graceful appearance. Most Athyriums die back in winter. 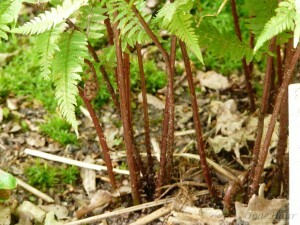 They have a short, creeping, upright rhizome. 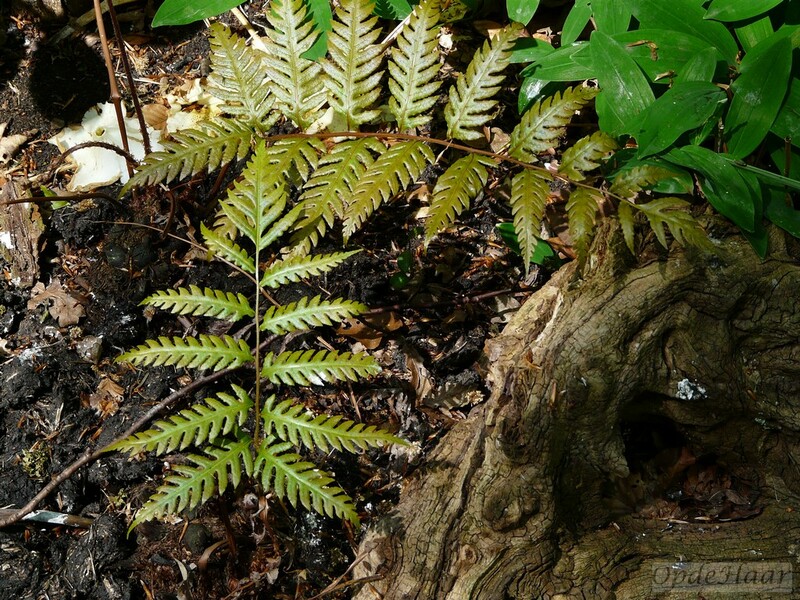 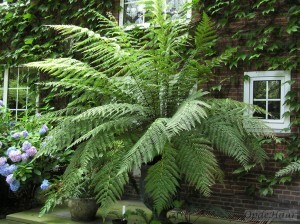 A few tropical varities, such as Athyrium oosorum, are tree ferns which can grow to several meters in height. 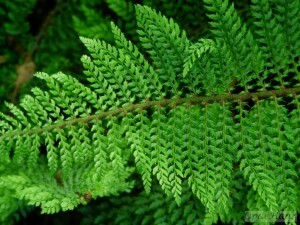 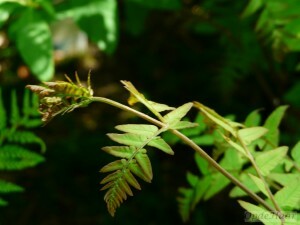 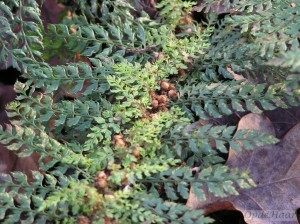 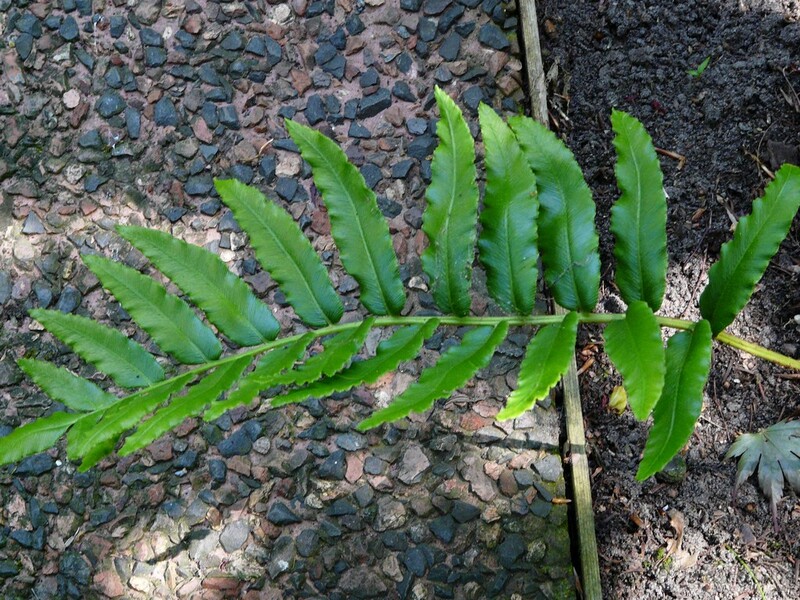 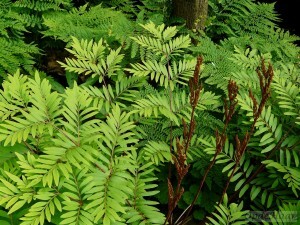 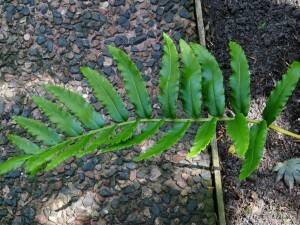 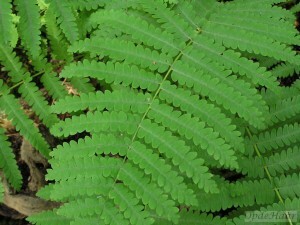 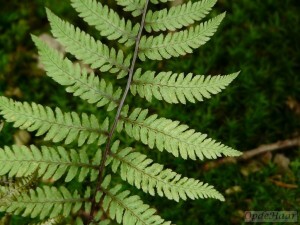 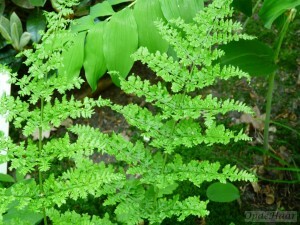 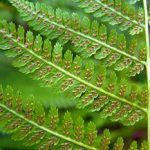 The fertile and sterile fronds are lancet or elliptical shaped, usually light green, 20-30cm long and 5 – 25 cm broad. 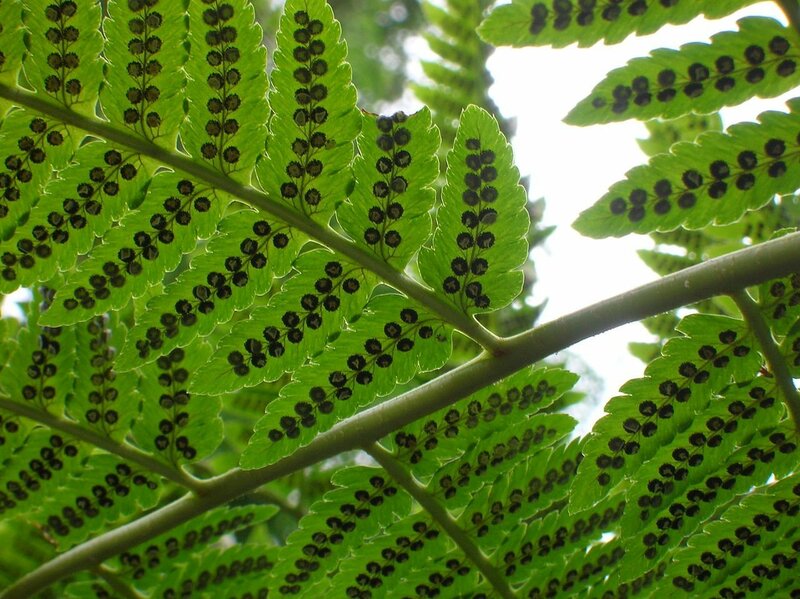 Sori, clusters of spores, appear as dots on the underside of the frond, 1–6 per pinnule or subleaflet. 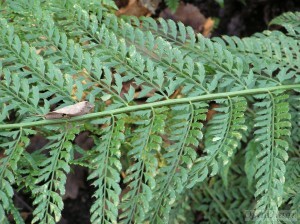 They are covered by a prominently whitish to brown kidney-shaped indusium. Fronds are very dissected, being 3-pinnate. 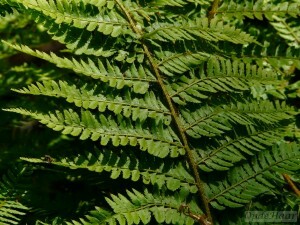 The stipe may bear long, pale brown, papery scales at the base. 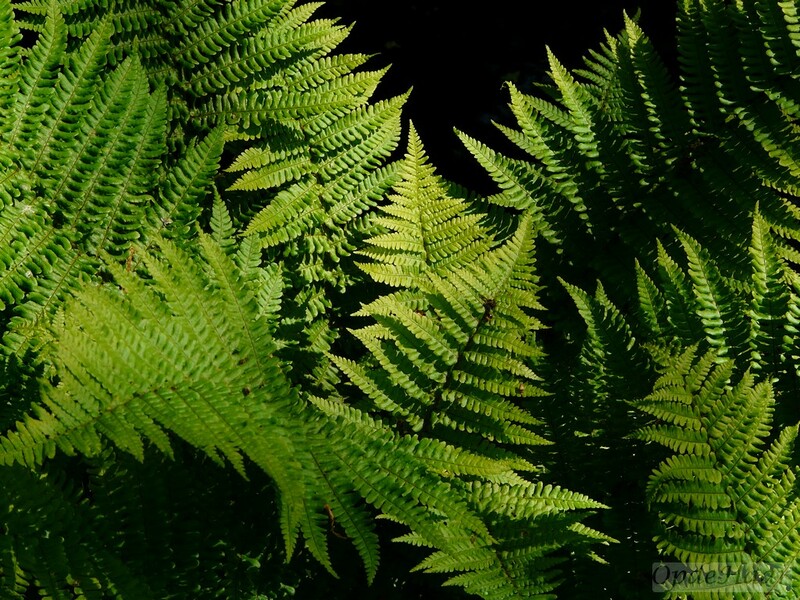 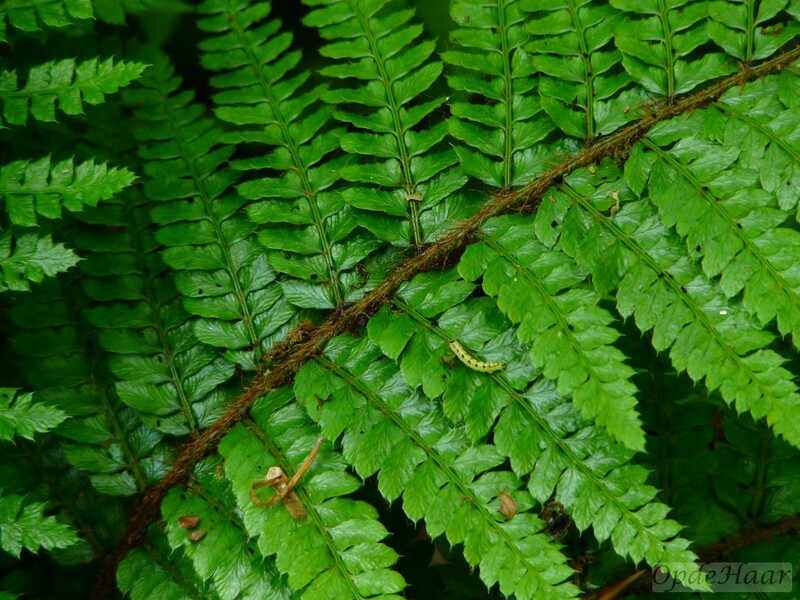 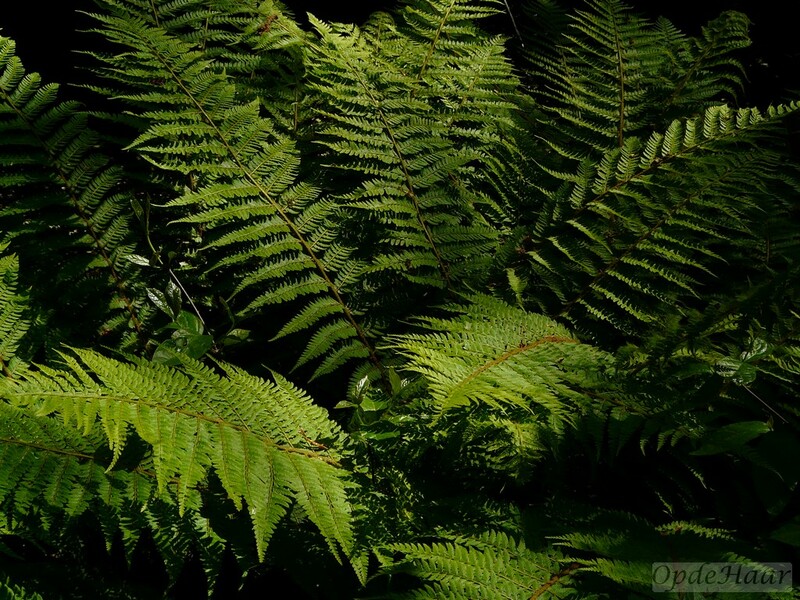 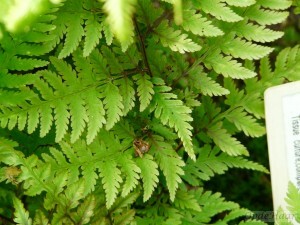 Blechnum (hard fern or deer fern) is a genus of between 150–220 species of ferns with a global distribution. 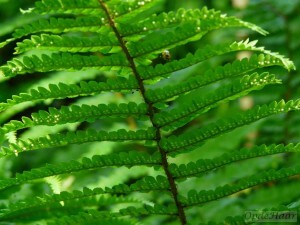 The majority of the species occur in tropical regions of the Southern Hemisphere. 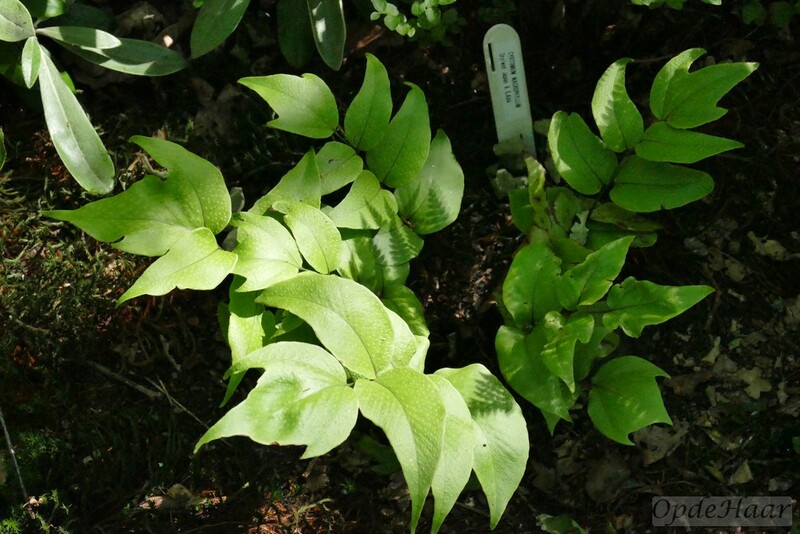 However there are a few speicies which grow in cool temperate climates such as B. penna-marina, which occurs around Cape Horn in Chile and B. spicant which grows in colder climates up as far as Iceland and northern Norway. 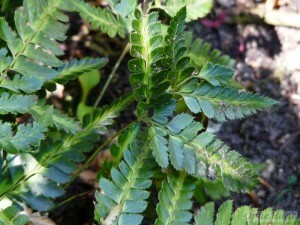 Most are herbaceous plants, but a few species (e.g. 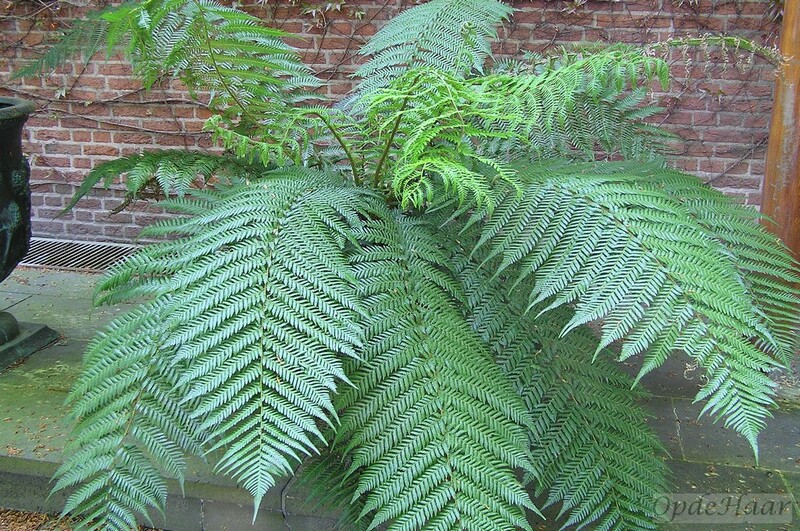 B. buchtienii and B. schomburgkii in Ecuador) are tree ferns with stems up to 3 m tall. 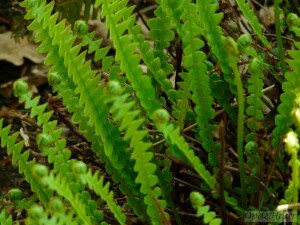 The characteristic of the Blechnum species is that it has both fertile and sterile fronds on the same plant. 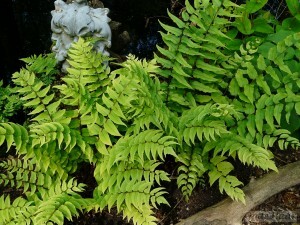 This feature distinguishes it from most other varieties. 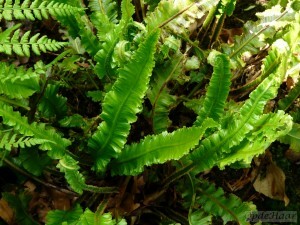 Blechnum spicant is very common in moist woods and in poor soil. The fertile fronds are about 70cm long, bear the spores in a line parallel to the central vein, have small sub-fronds and stand upright. 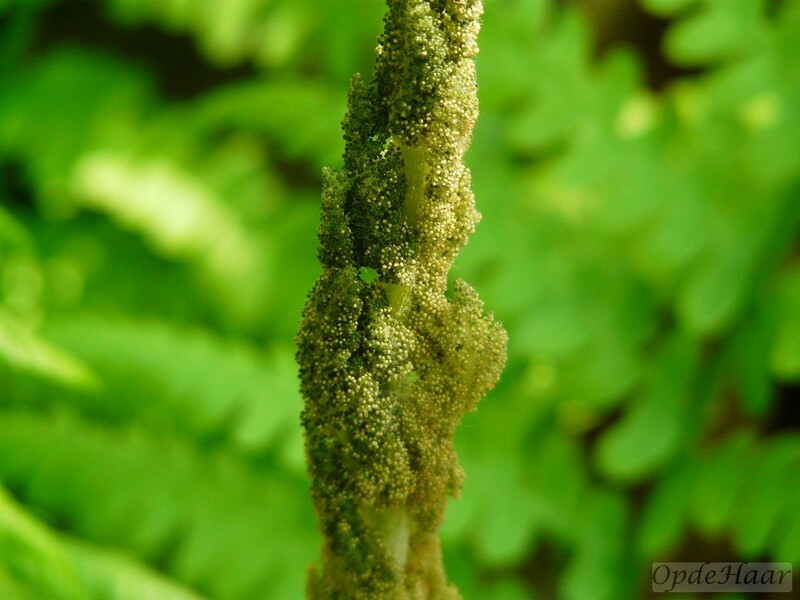 The spores ripen in July and August. 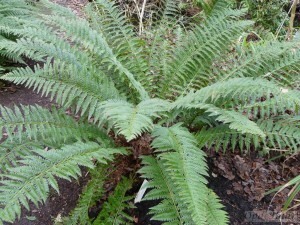 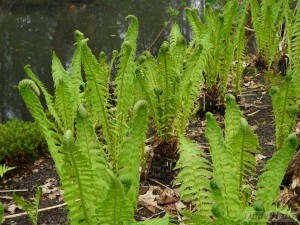 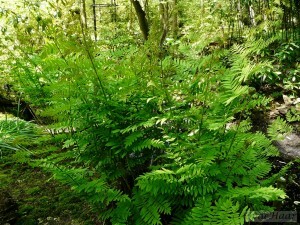 The sterile fronds are about 40cm long and flop onto the ground. 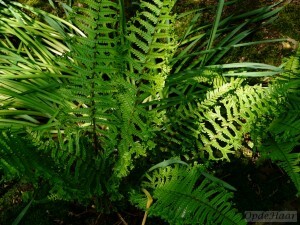 It is evergreen and grows to about 0.5 meters. 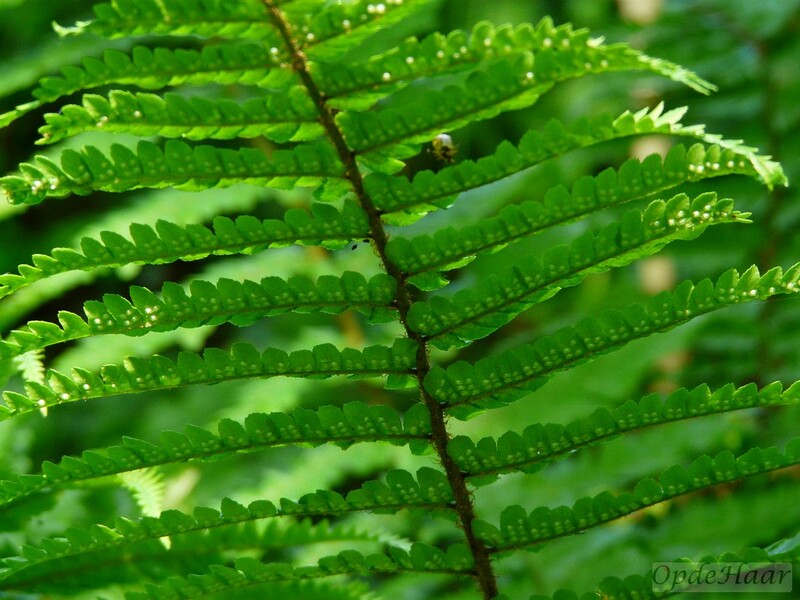 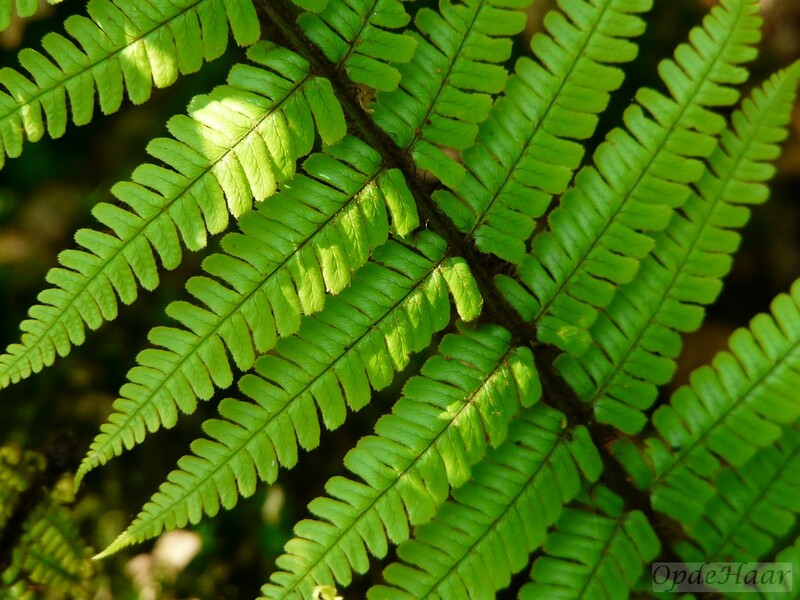 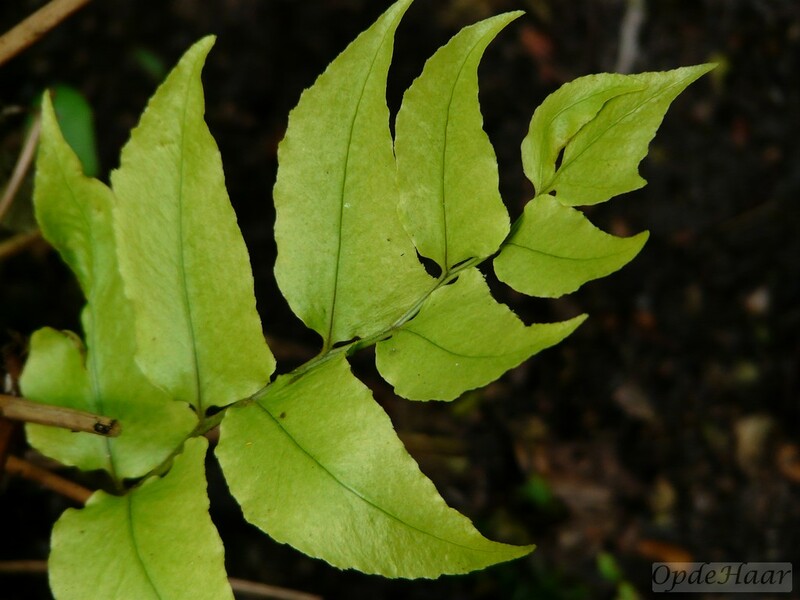 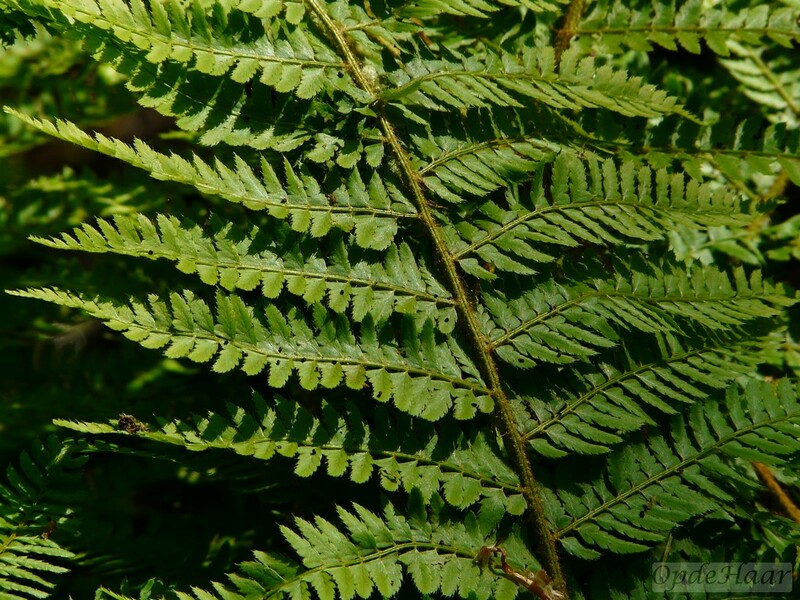 Dryopteris, commonly called wood fern, male fern (referring in particular to Dryopteris filix-mas)or buckler fern, is a genus of about 250 species of ferns with distribution in the temperate Northern Hemisphere, with the highest species diversity in eastern Asia. 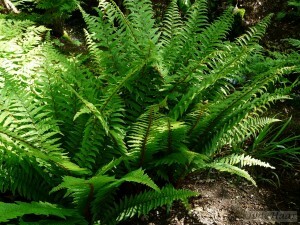 They grow in woodland, open areas and sometimes on rocky ground in mountain areas. 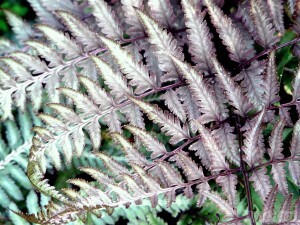 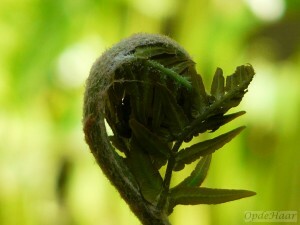 In The Netherlands 7-8 varieties occur naturally of which the Dryopteris dilata is the most common. The roots on many of the species are fat and slowly creep. 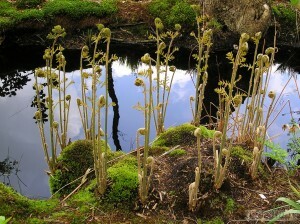 The fronds form a vase-like ring. 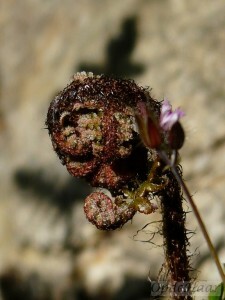 The sori are round, with a kidney-shaped indusium. 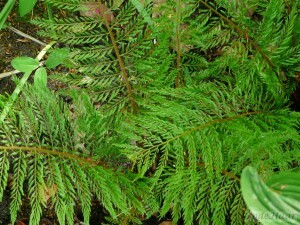 The stipes (stalks below the fronds) have prominent scales. 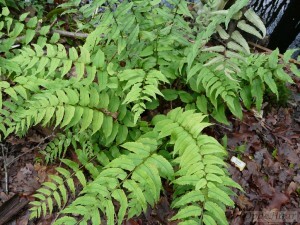 In our wood Dryopteris dilata is the most common naturally occurring fern and almost has weed status. Hybridisation is a well-known phenomenon within this group, with many species formed by this method. The genus is also subdivided into Polystichum, Crytomuim and Arachnoides. 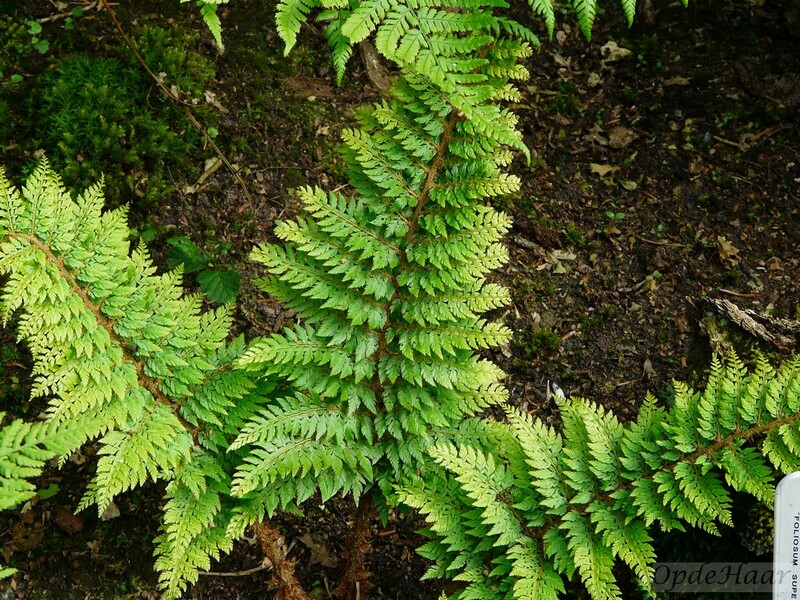 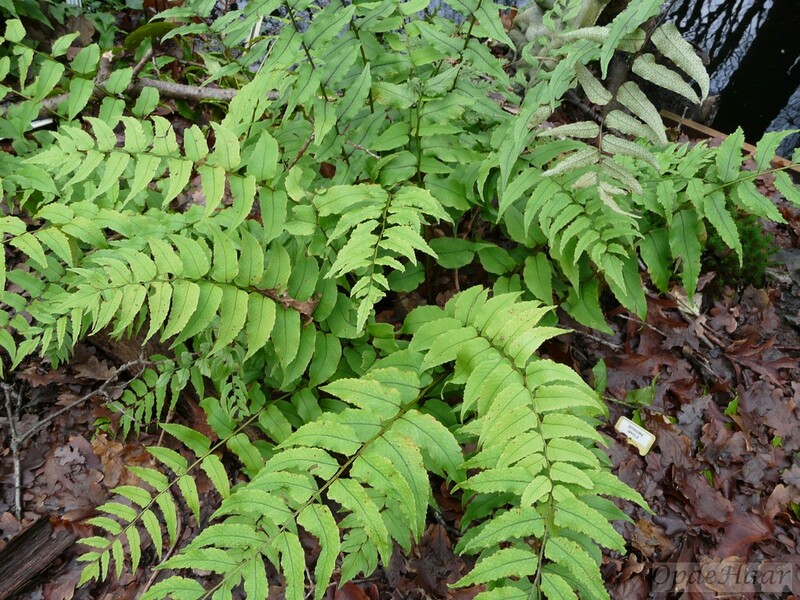 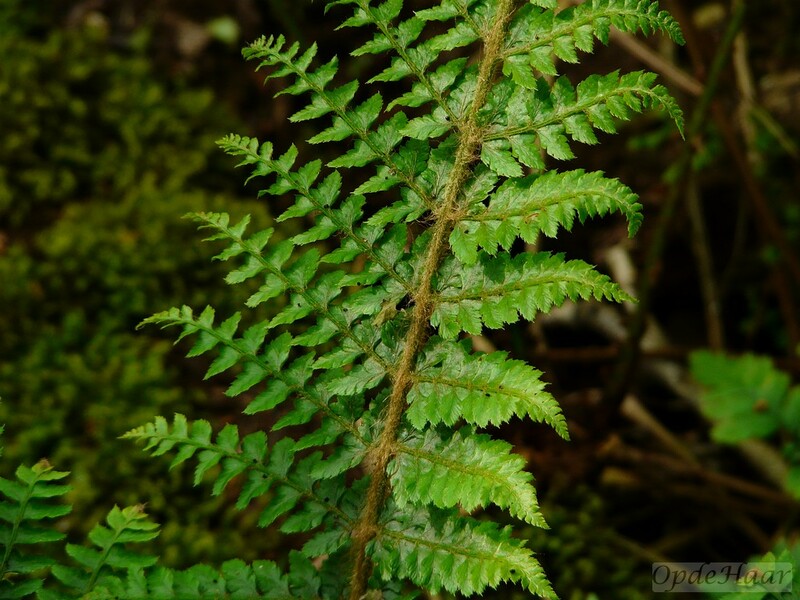 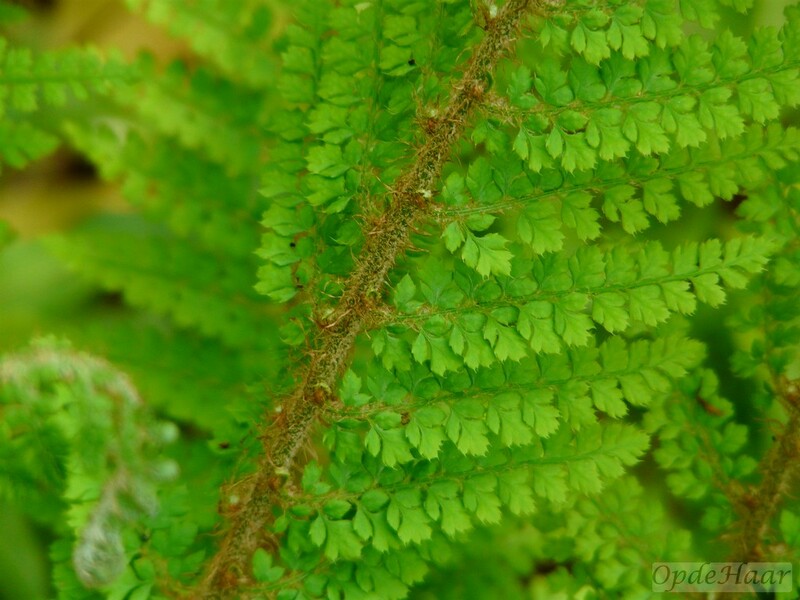 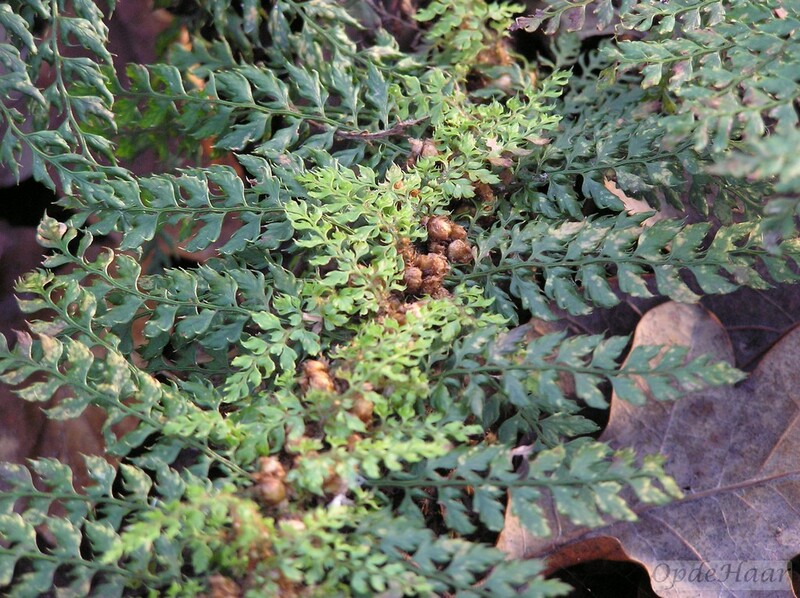 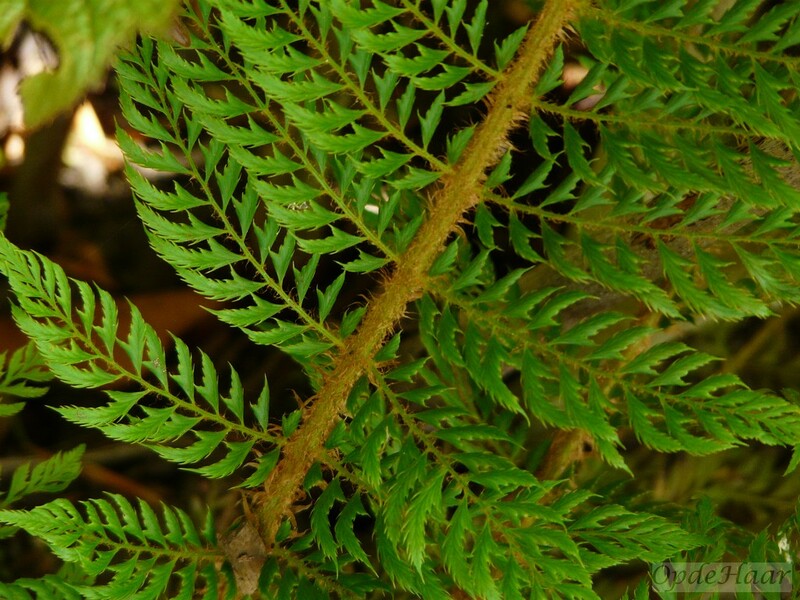 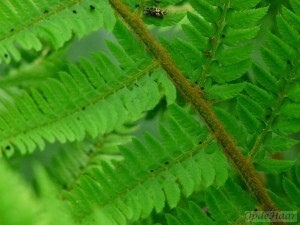 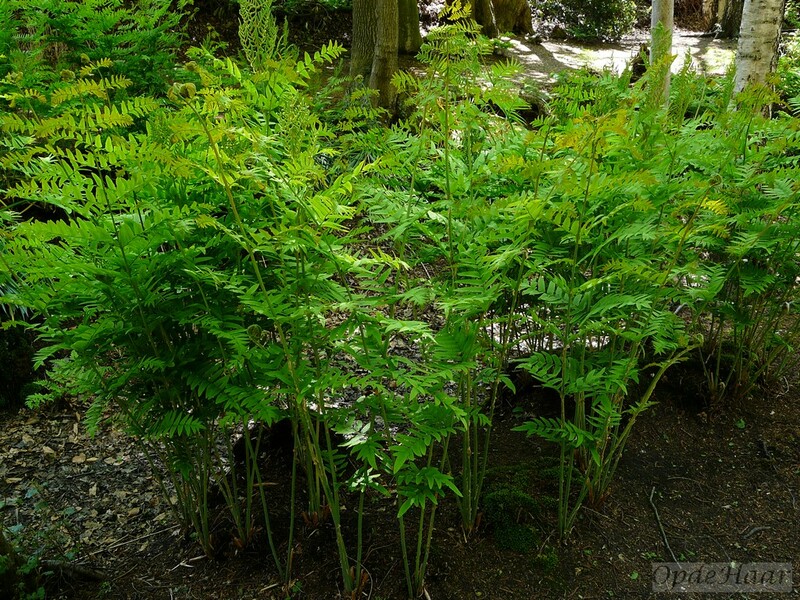 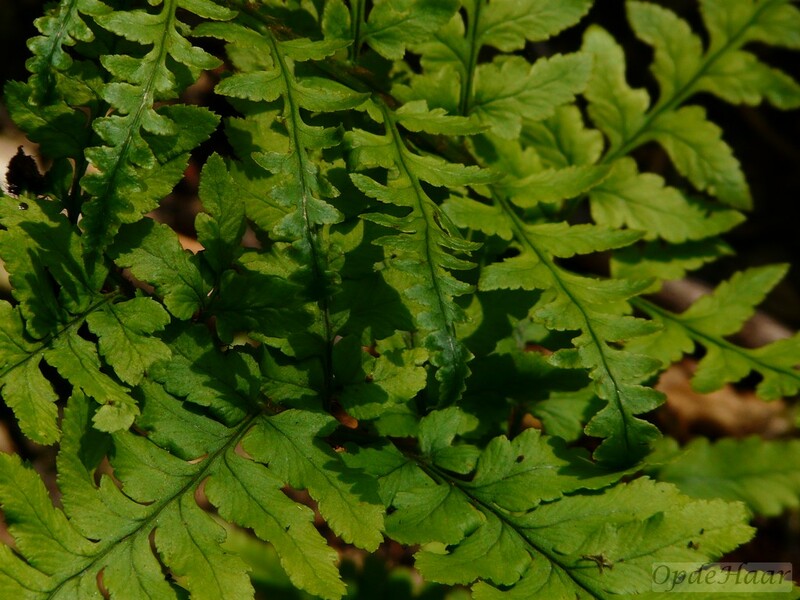 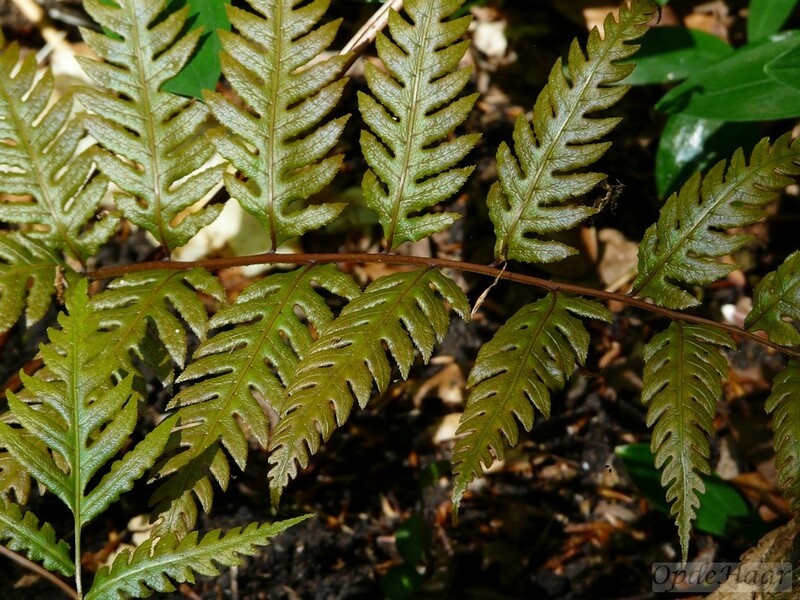 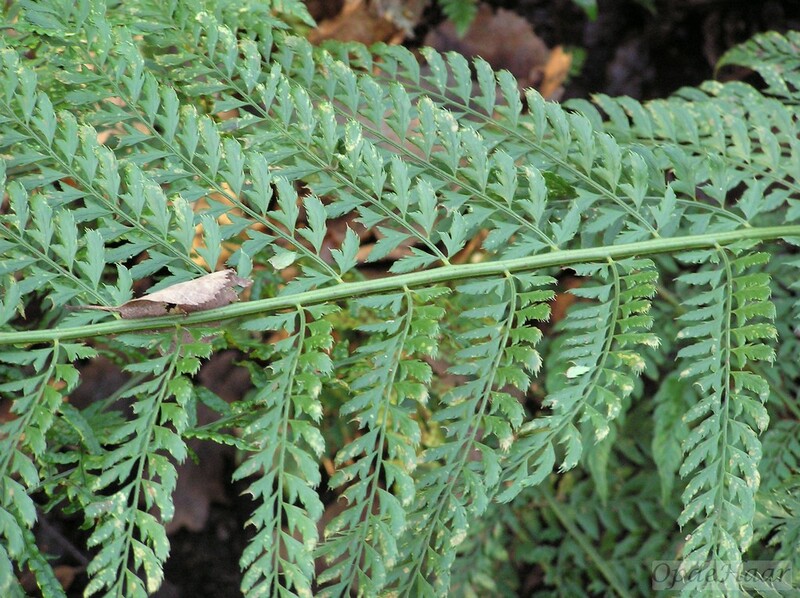 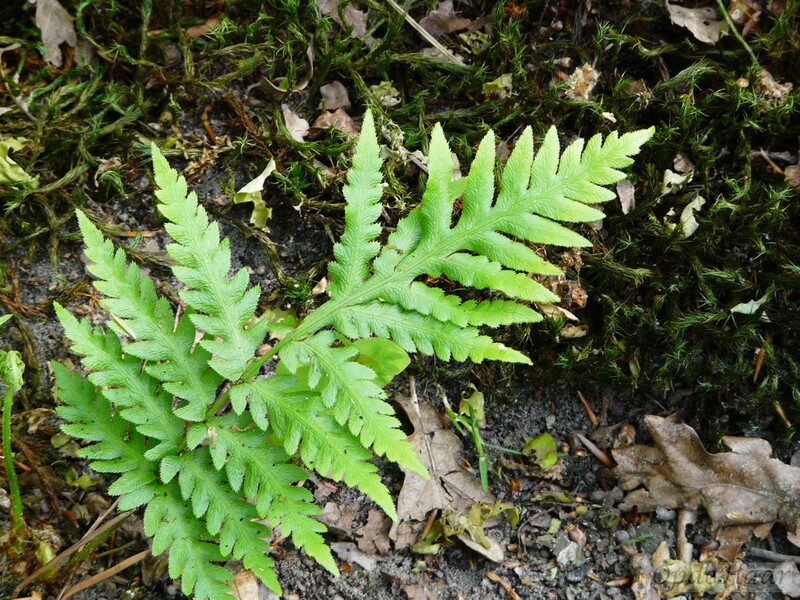 Arachniodes is a fern genus in the Dryopteris family (wood ferns). 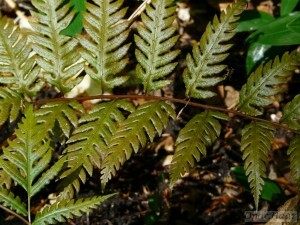 A number of species in this genus are known as “holly ferns”. 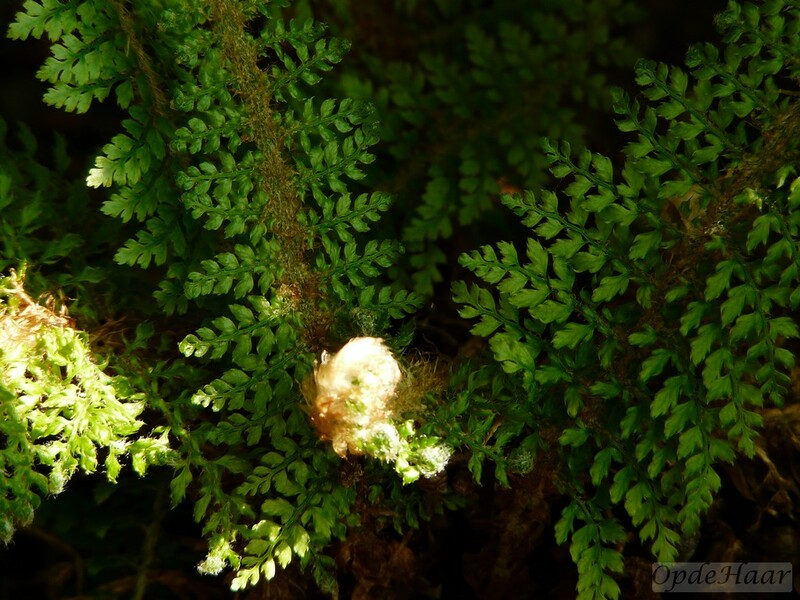 There are between 100 and 140 species in the Arachnoides family. 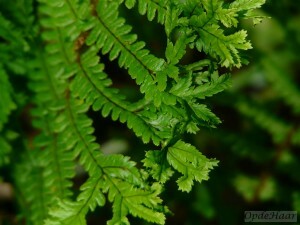 They occur mostly in tropical and sub-tropical area, particularly in China and East Asia. The leaves are all symmetrical, small and triangular or 5-sided and divided into 2 or 4. 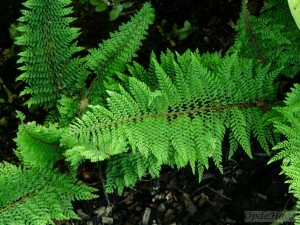 The fronds end in a point and have a papery or leathery feel. 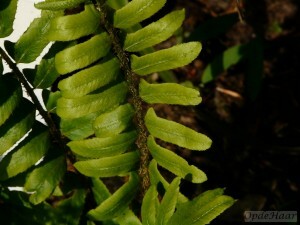 The stalk is about the same length as the frond and has more than 3 veins in a curve. 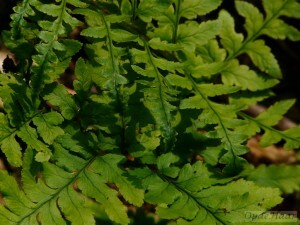 Cyrtomium is a genus of about 15-55 species of ferns in the Dropteris family. 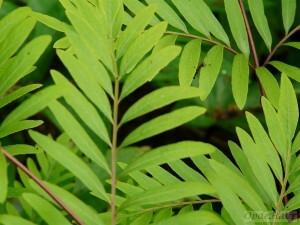 It is native to Asia, Africa (including Madagascar), and the Pacific Ocean islands (Hawaii). 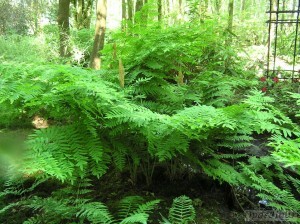 However In Begium and The Netherlands Crytomium falcatum, commonly known as the holly fern, has been found in the wild. 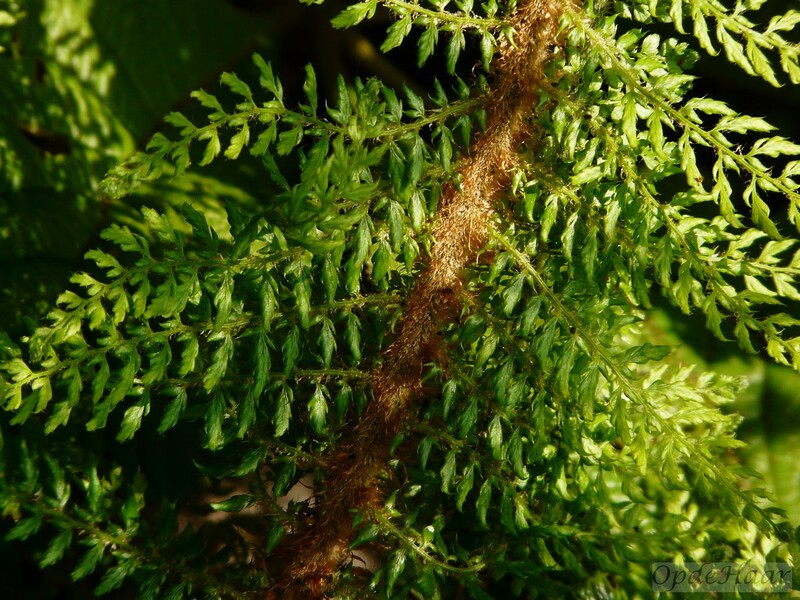 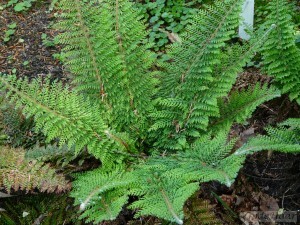 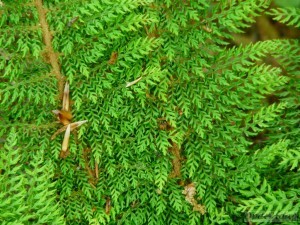 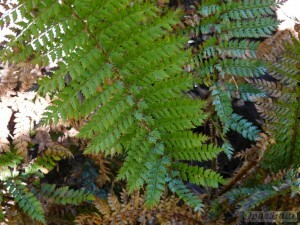 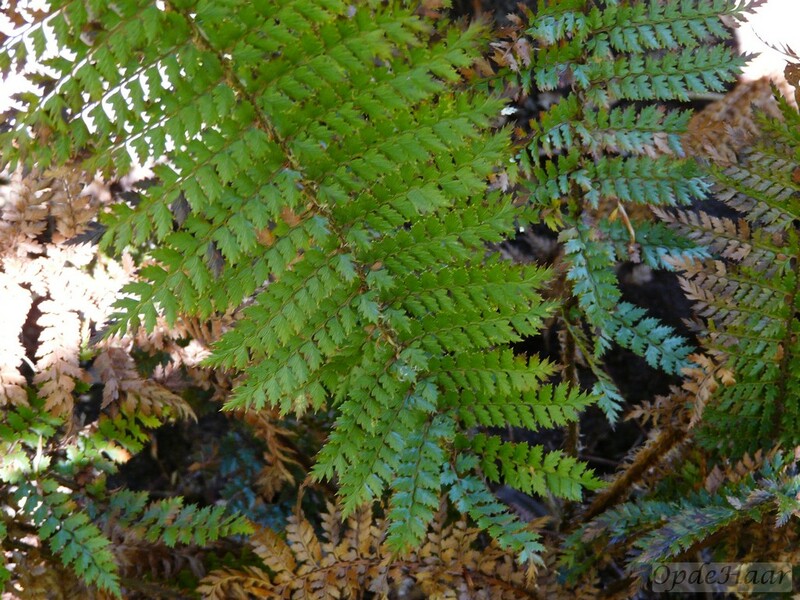 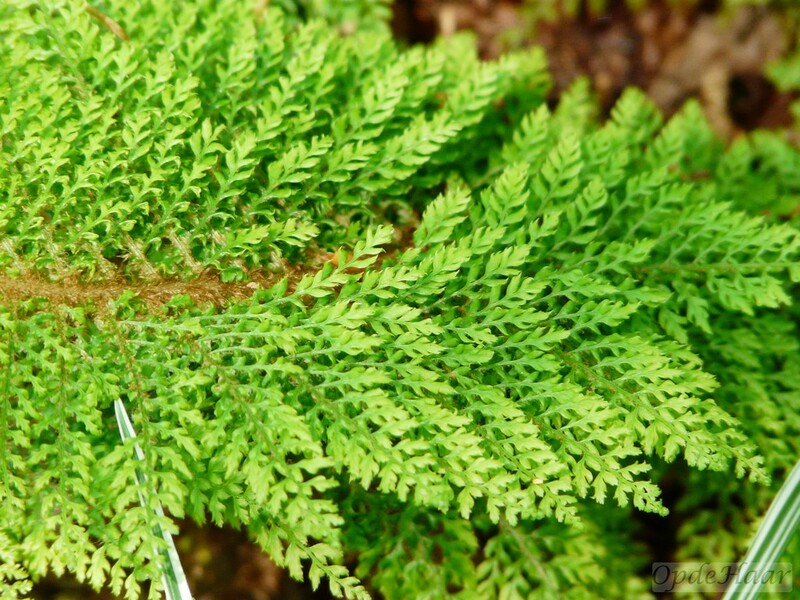 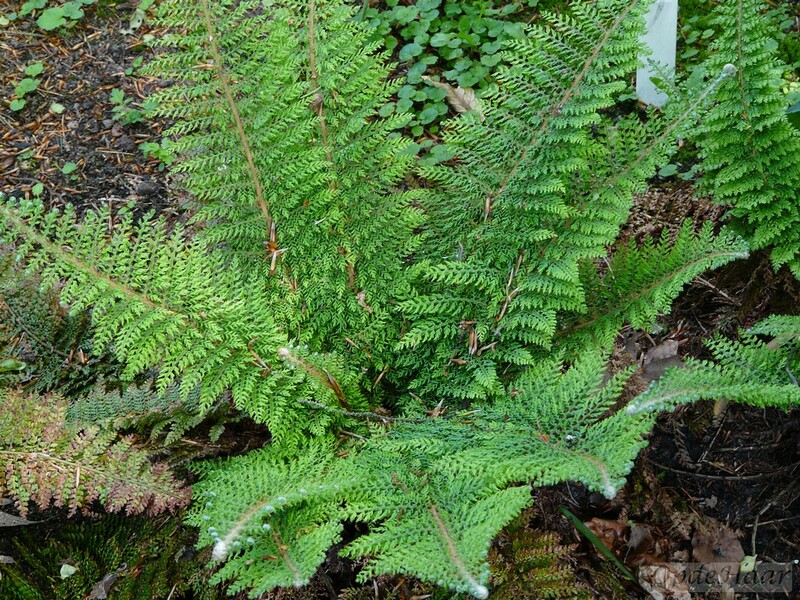 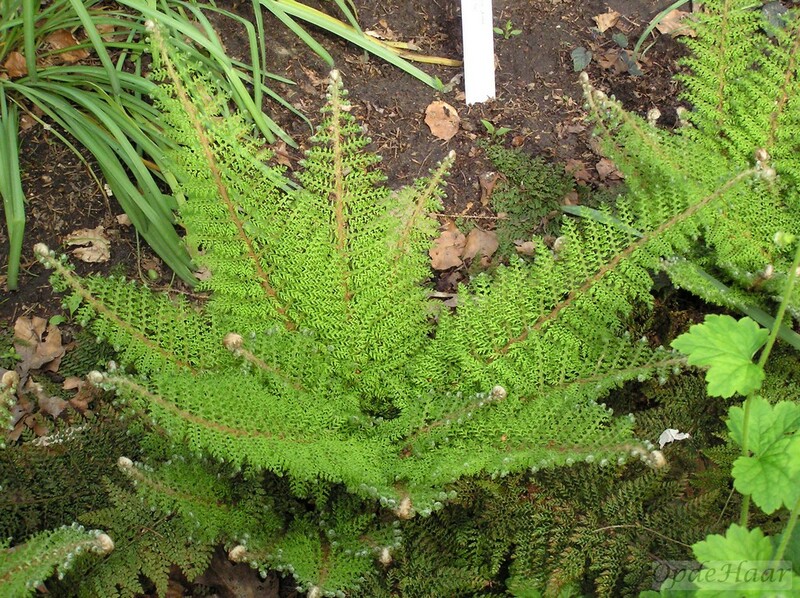 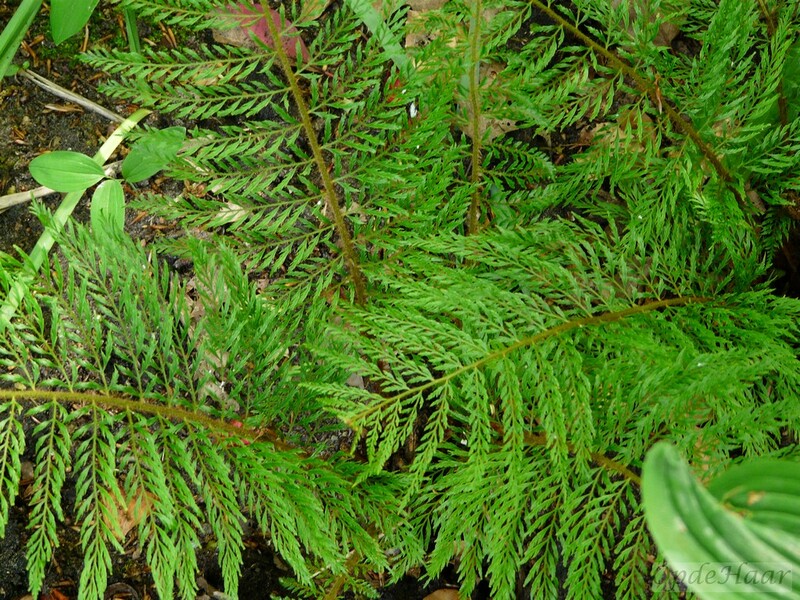 The species is very closely related to the genus Polystichum and recent research has suggested that it should be included within this category. 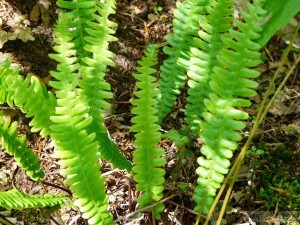 It grows in crevices, on coastal cliffs, streambanks, rocky slopes, and other moist, areas. 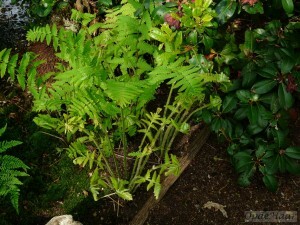 This fern is a perennial plant with a large light brown rhizome. Cyrtomium falcatum has leaves longer than 0.5 metres in length made up of six to ten pairs of shiny bright green leaflets. 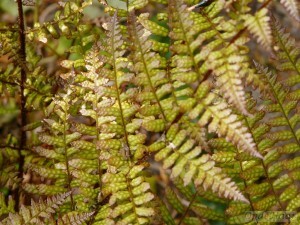 Each leathery leaflet has a flat to wavy to slightly toothed margin and a netlike pattern of veining. The underside of each leaflet has sori beneath brown or black indusia. Cyrtomium falcatum is a popular ornamental plant in temperate climate gardens (zones 7 to 10). 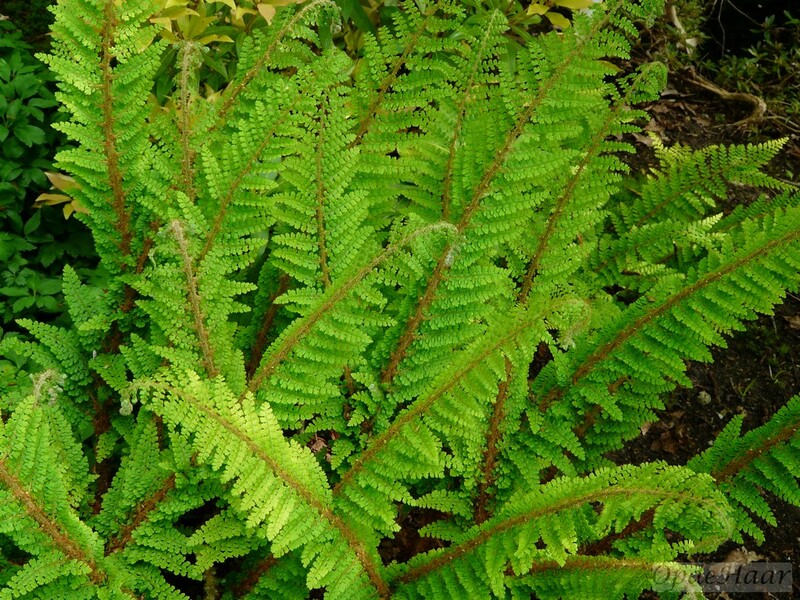 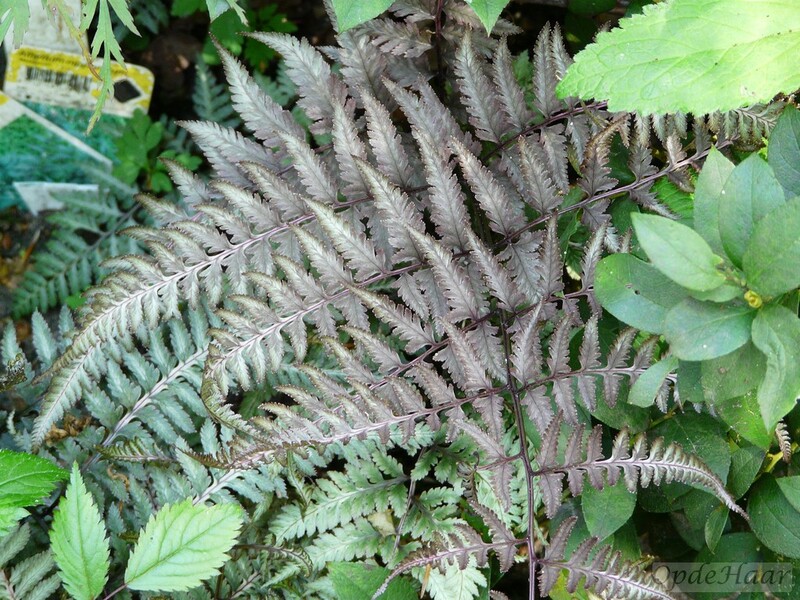 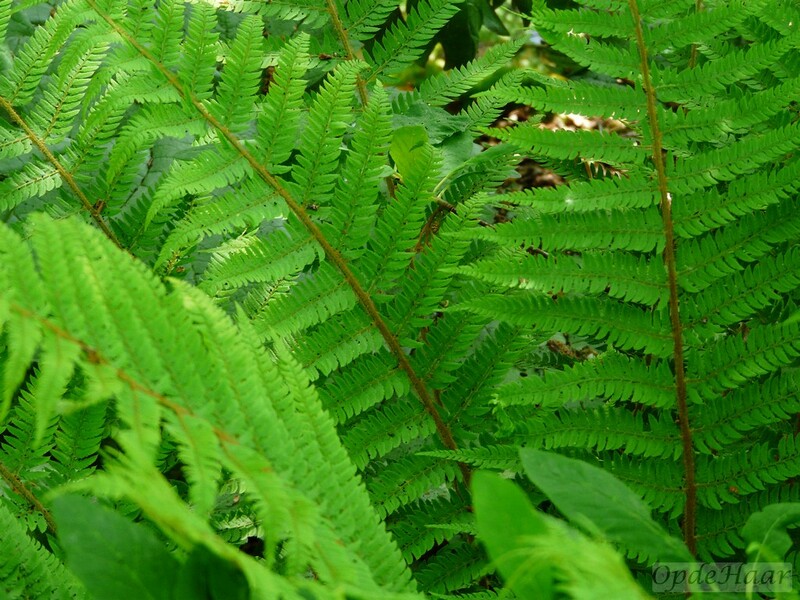 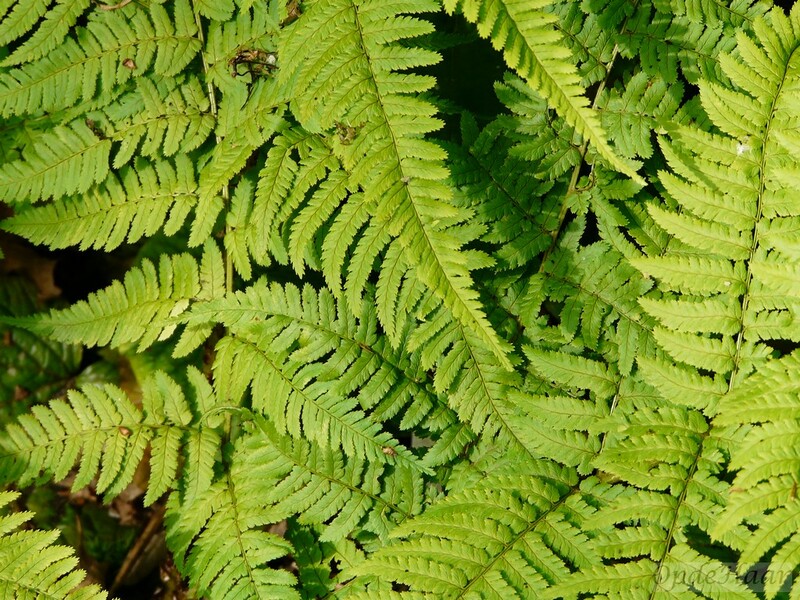 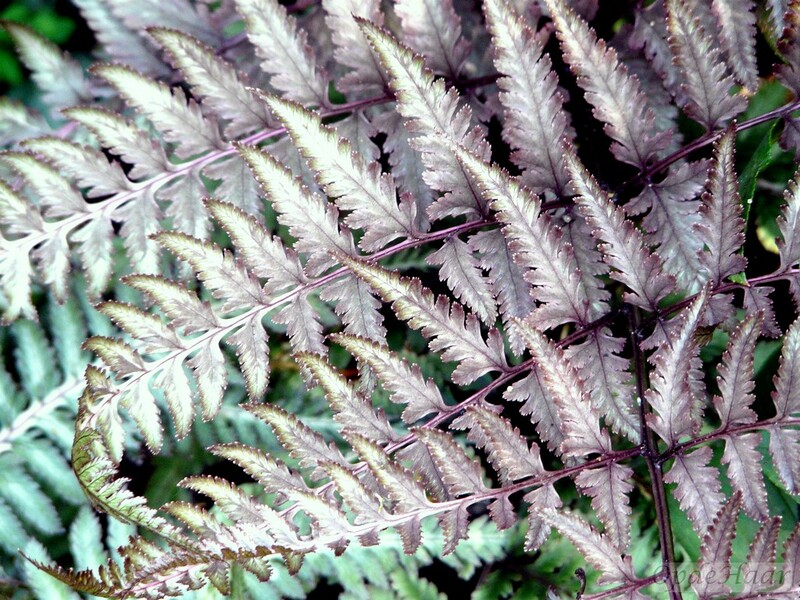 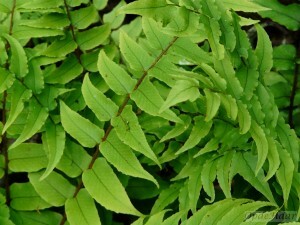 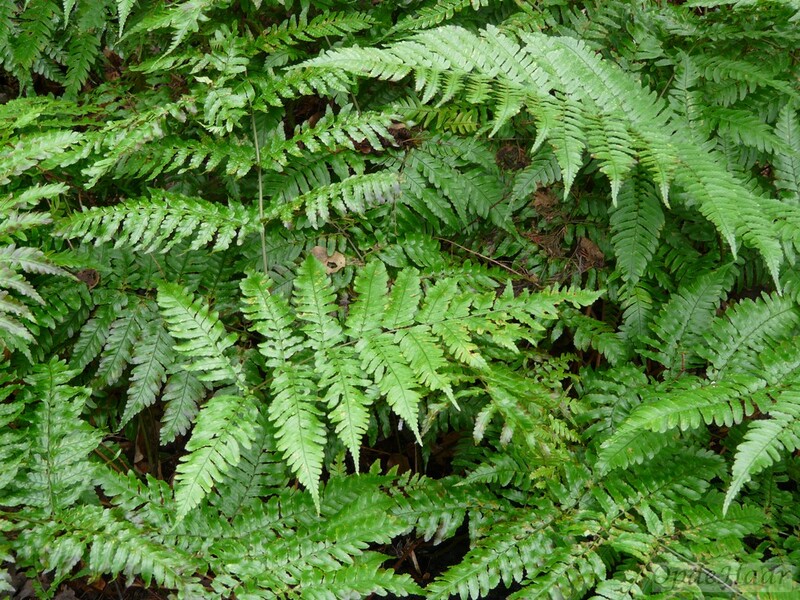 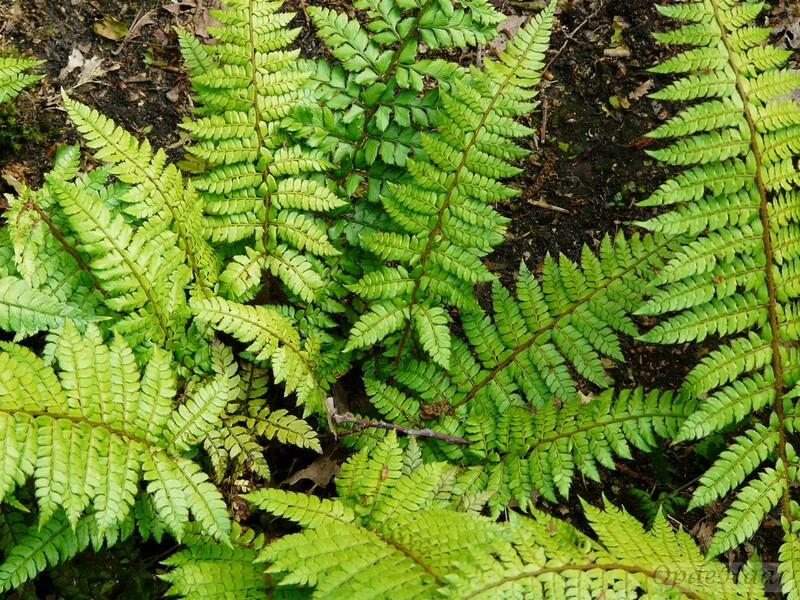 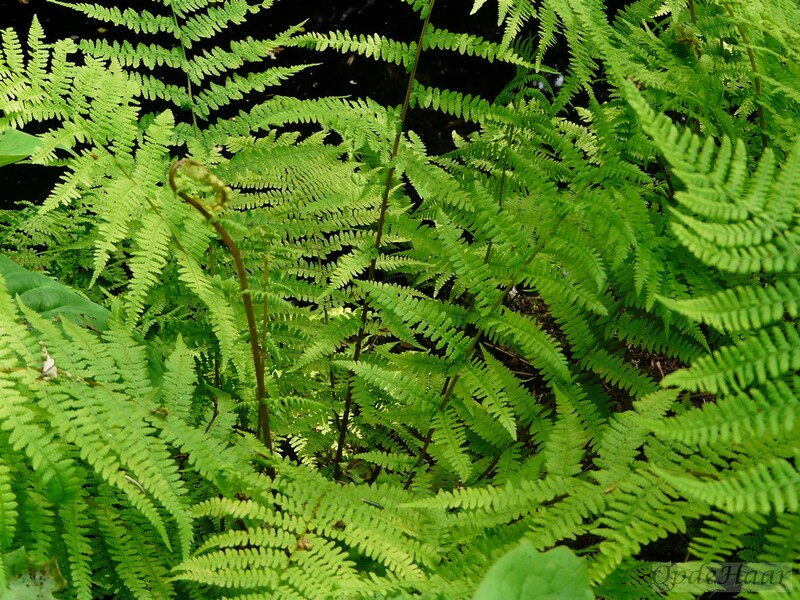 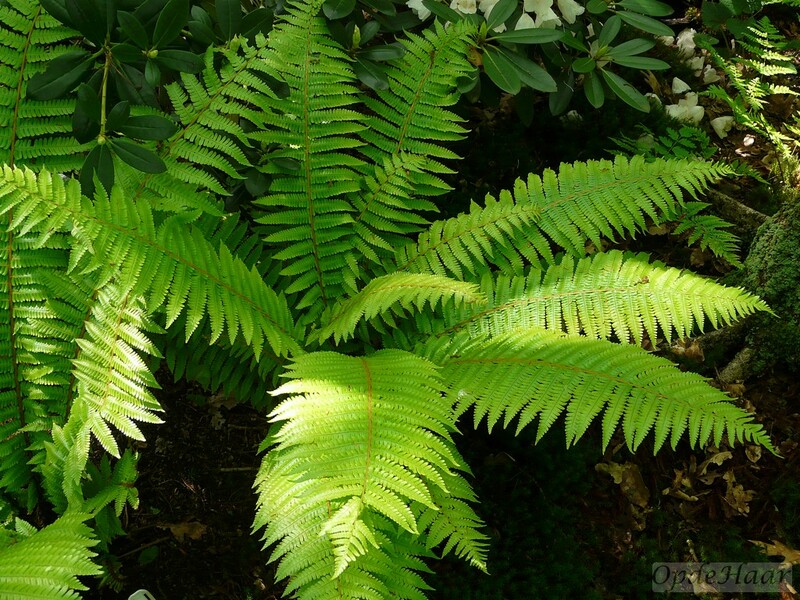 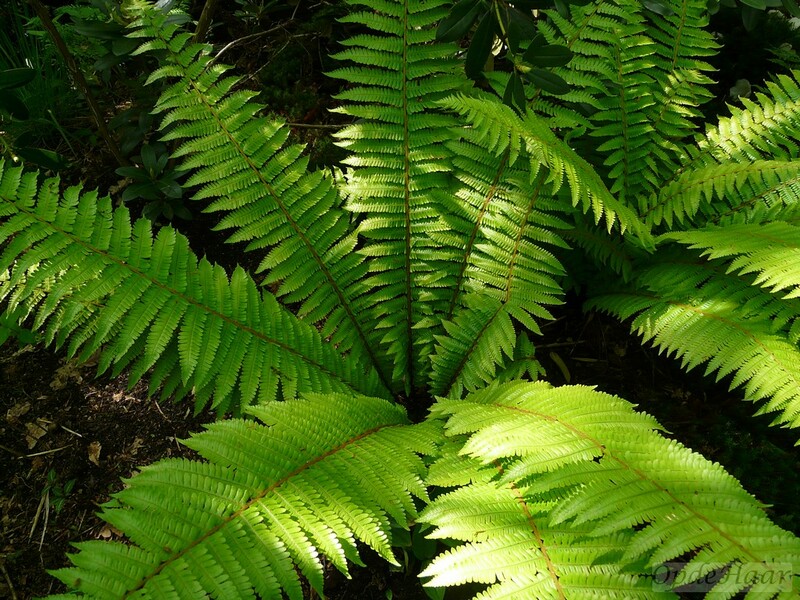 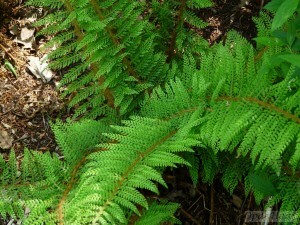 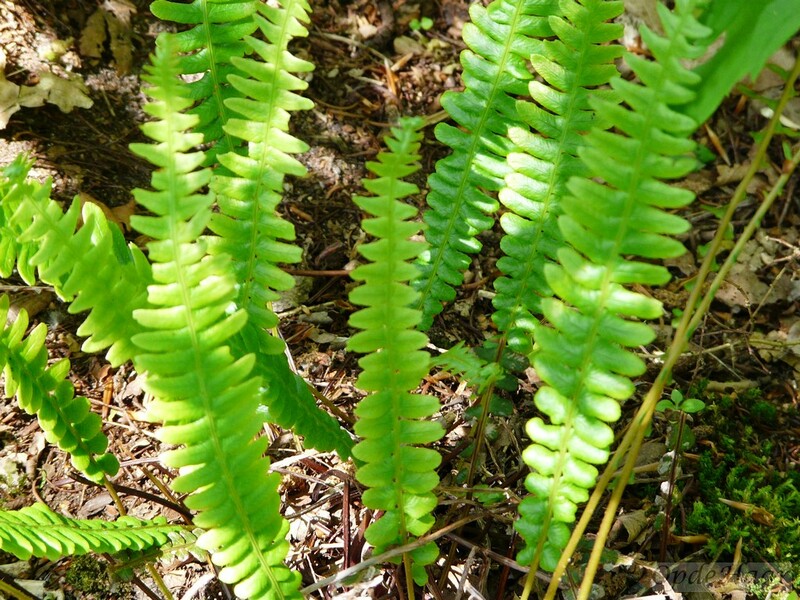 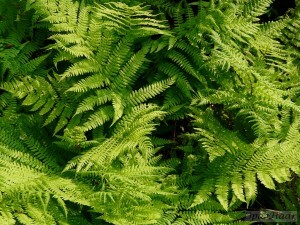 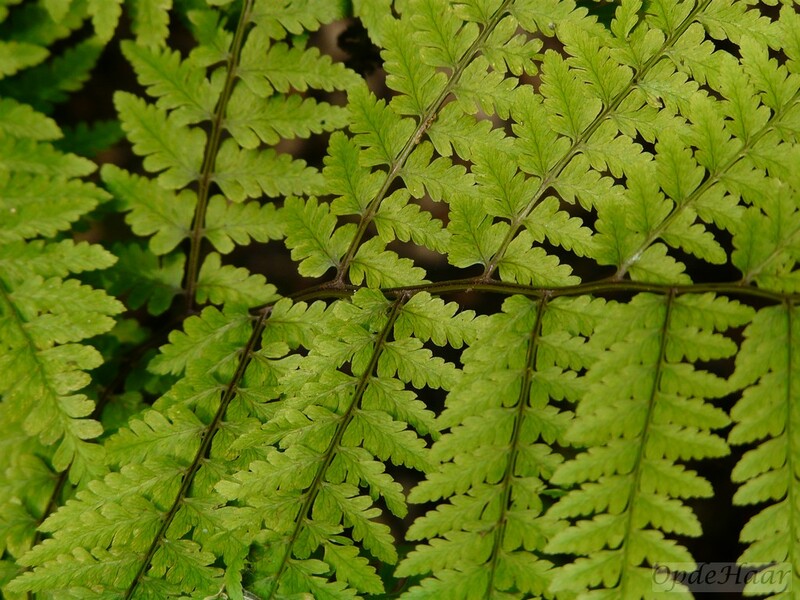 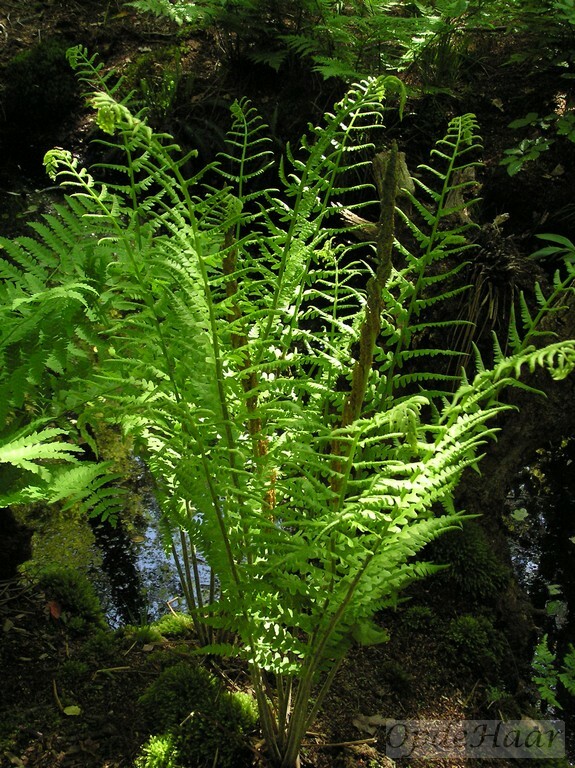 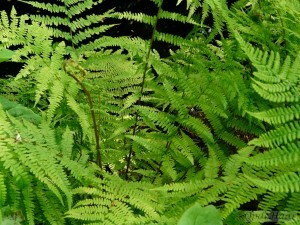 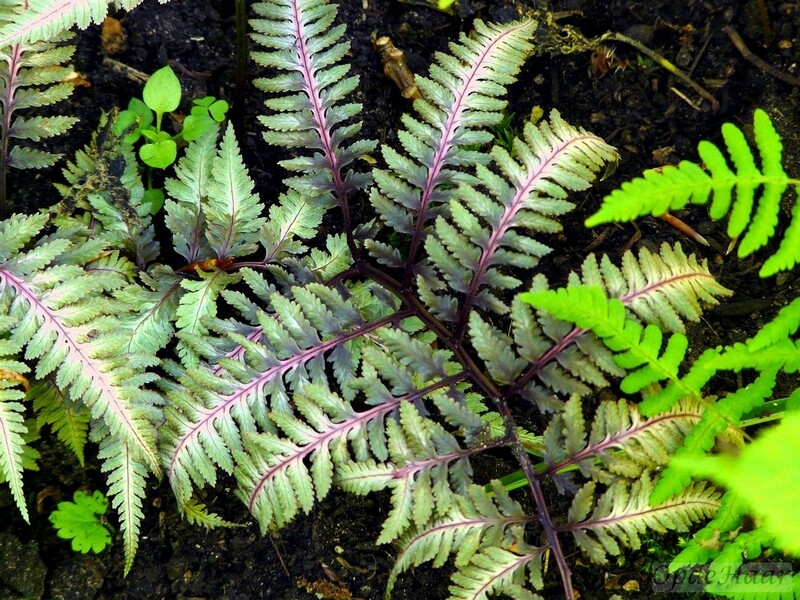 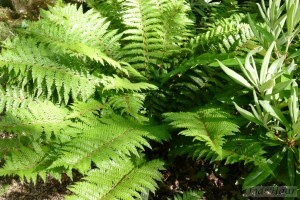 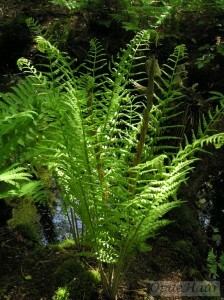 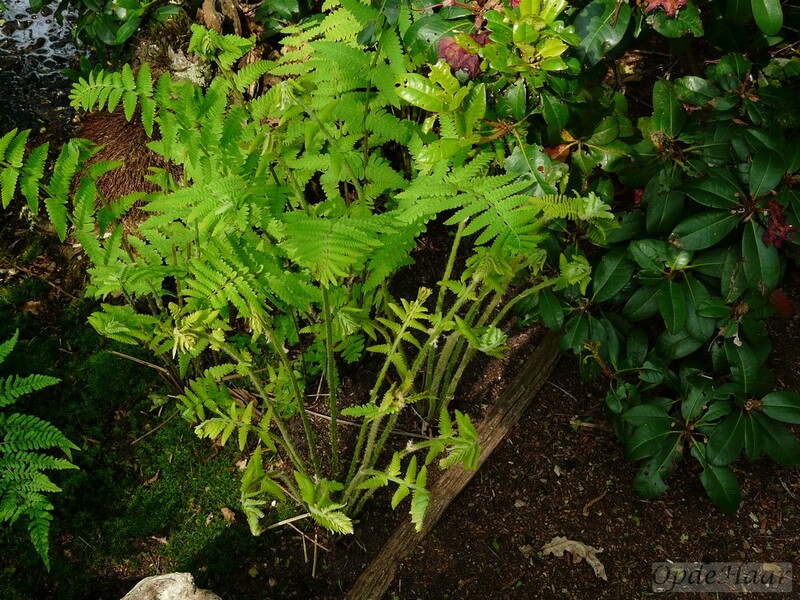 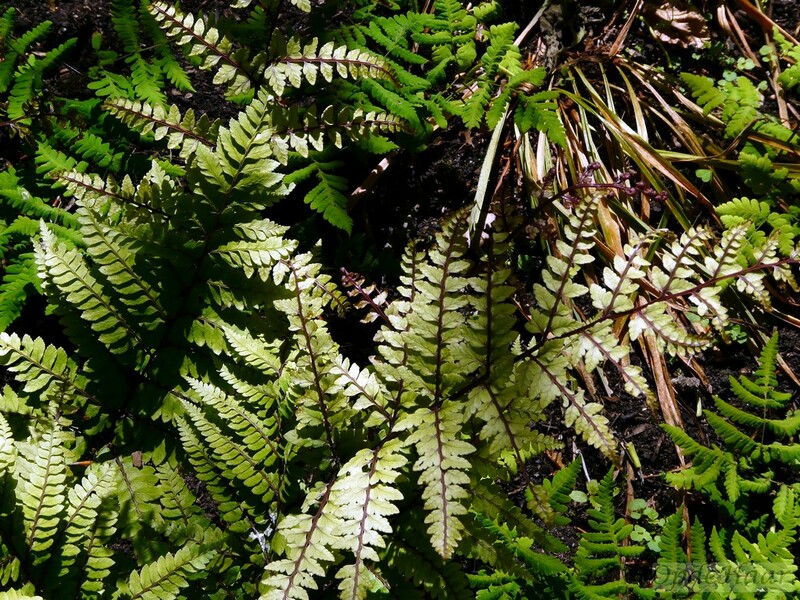 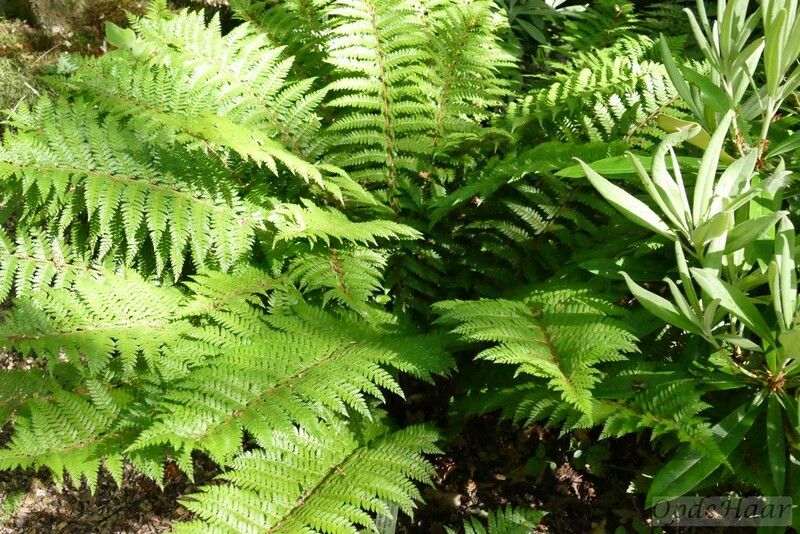 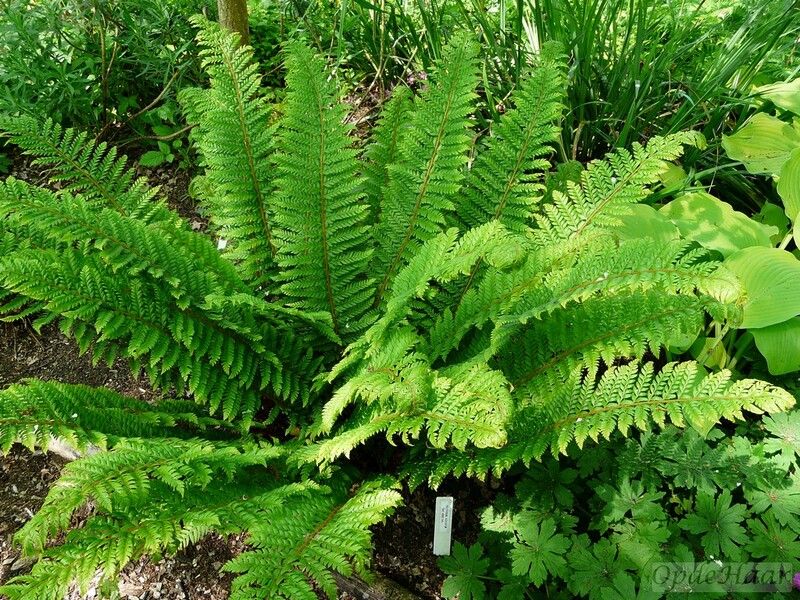 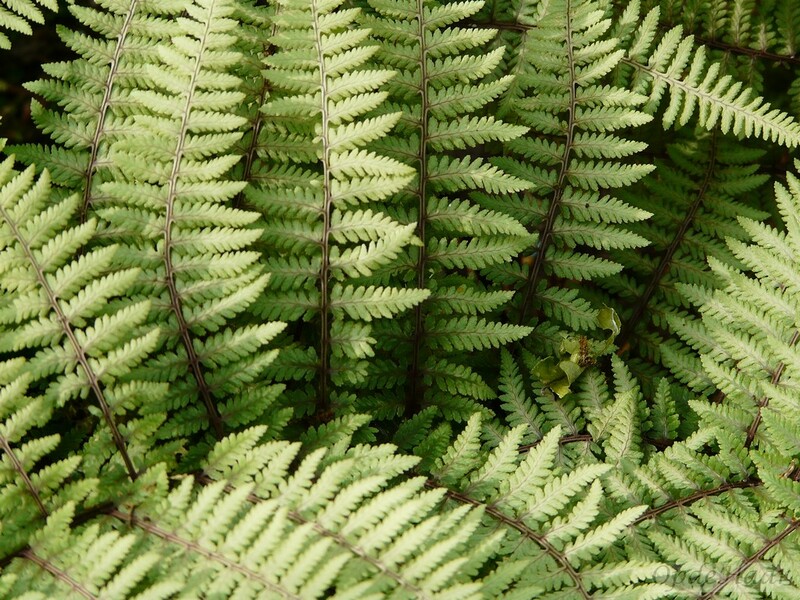 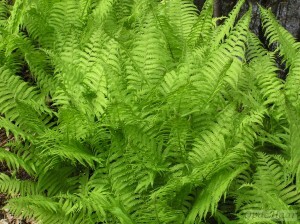 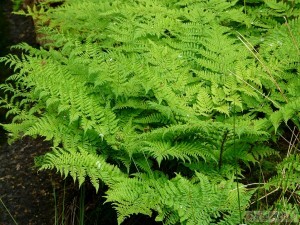 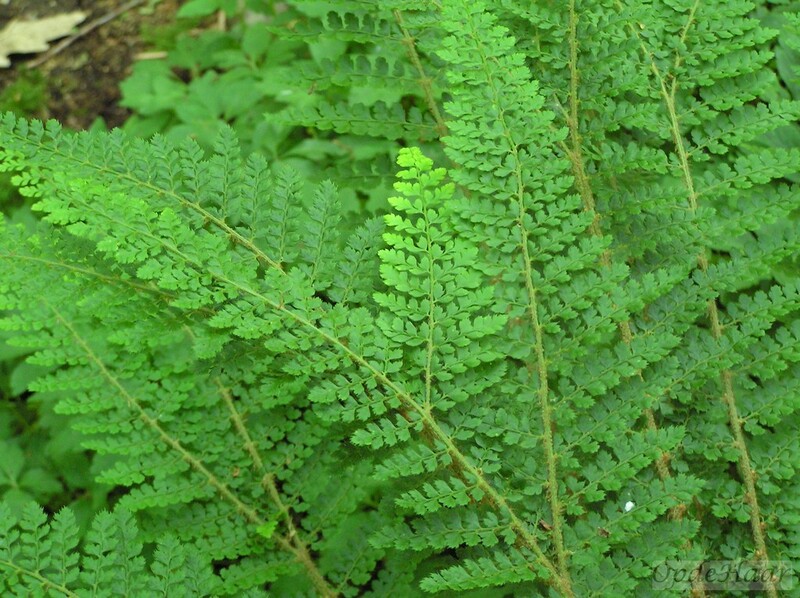 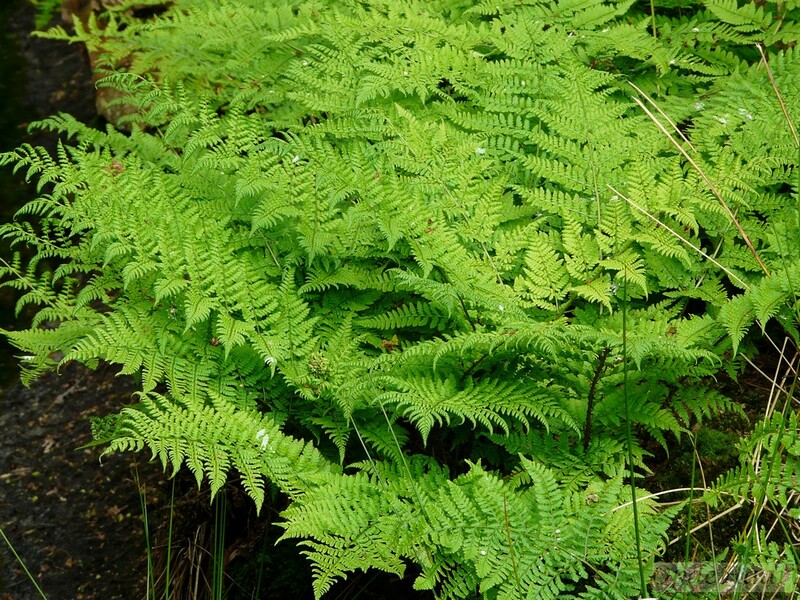 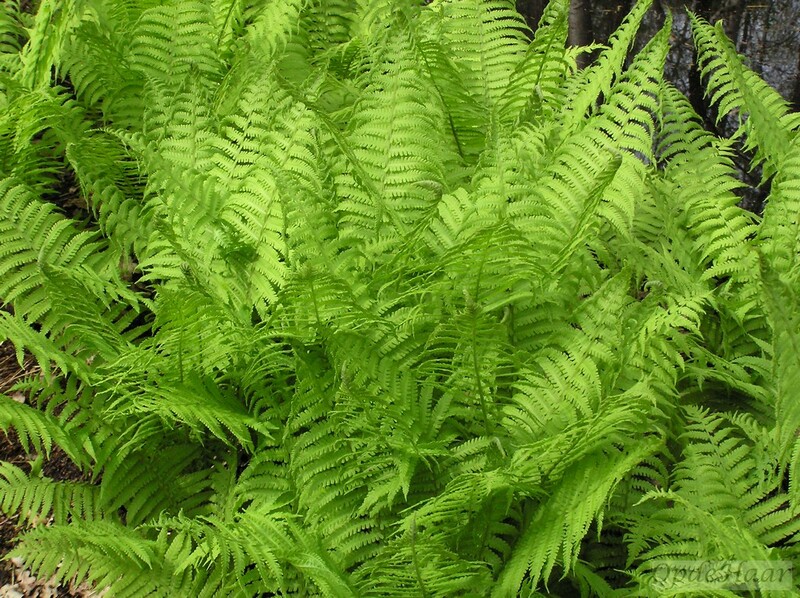 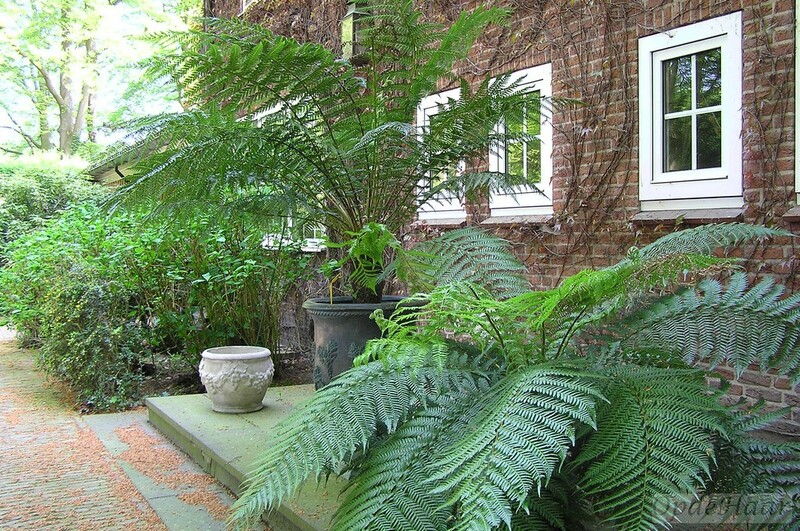 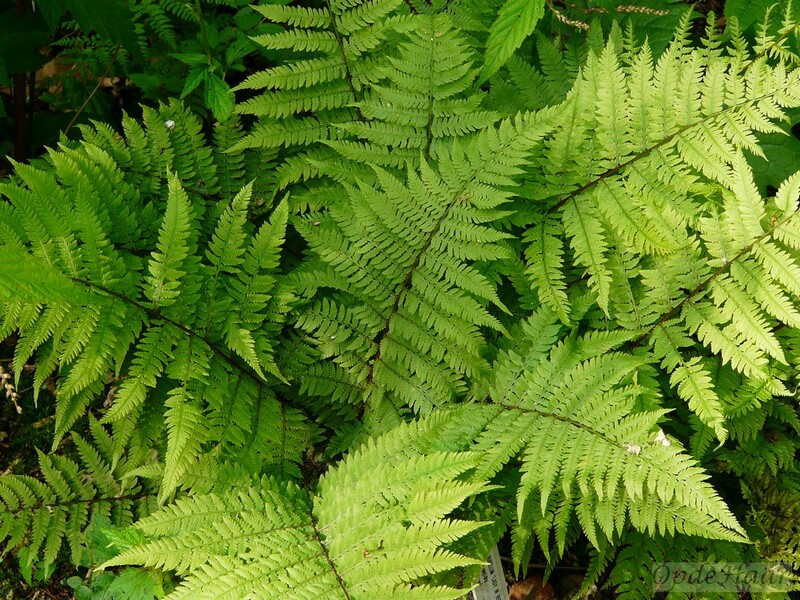 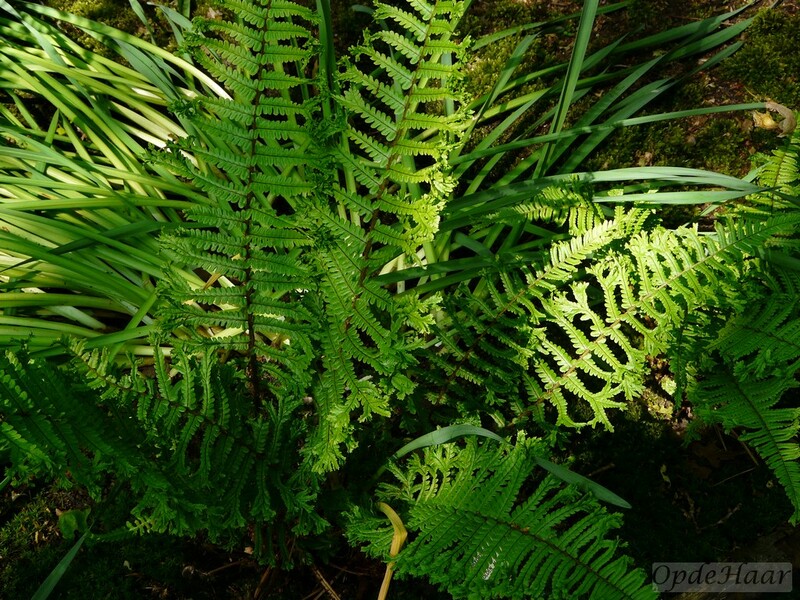 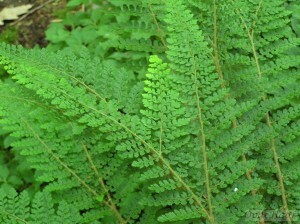 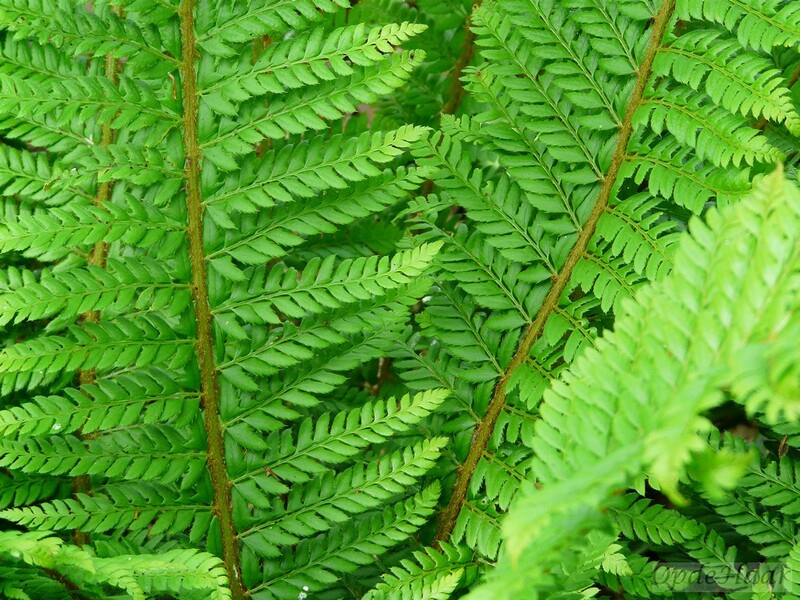 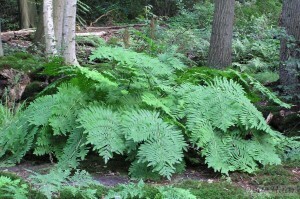 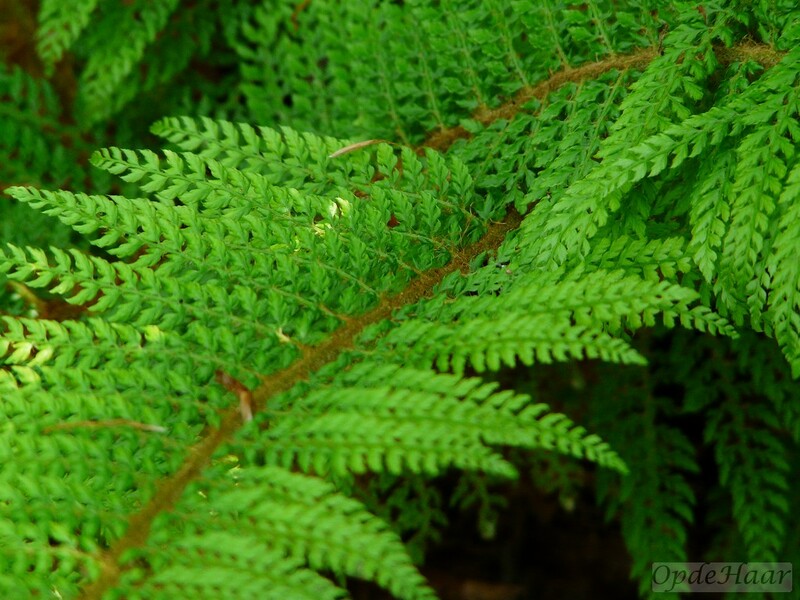 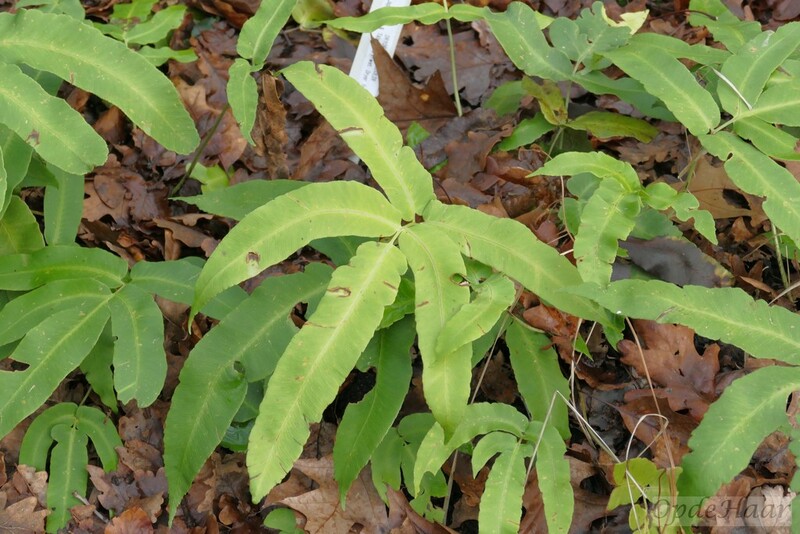 It is hardier than most ferns; it thrives in light shade to deep shade with average fern soil. 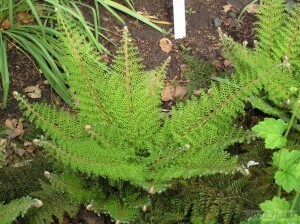 It is easily and quickly propagated by spores, but can be propagated via rhizome division. 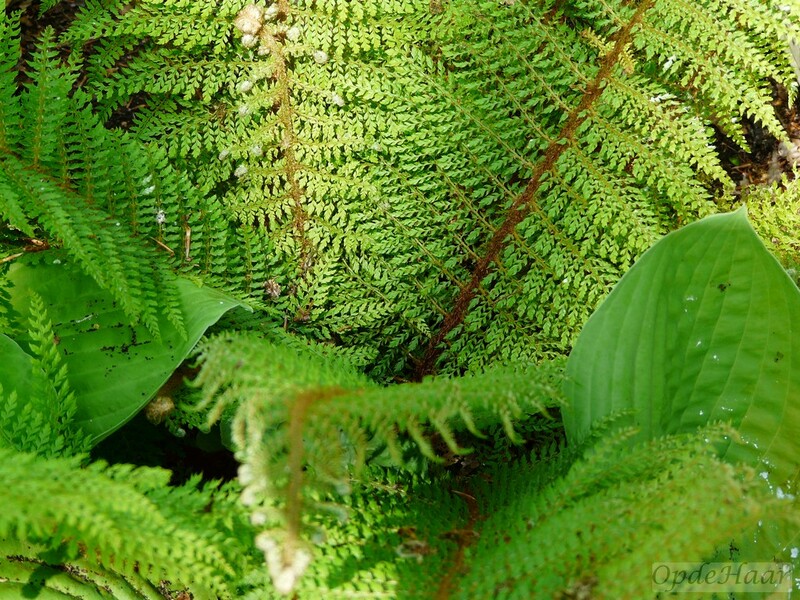 Polystichum is a genus of about 260 species of ferns with a wide distribution. 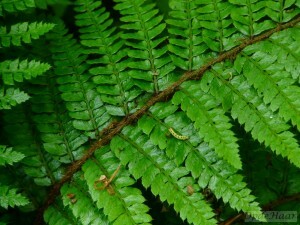 About 120 species are found in China alone, while nearly 100 species are found between Mexico and Brazil. 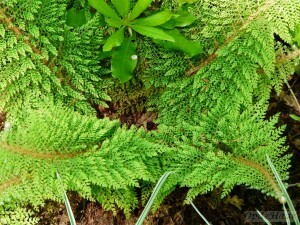 North America has only 15 native species and Europe just 5 species. 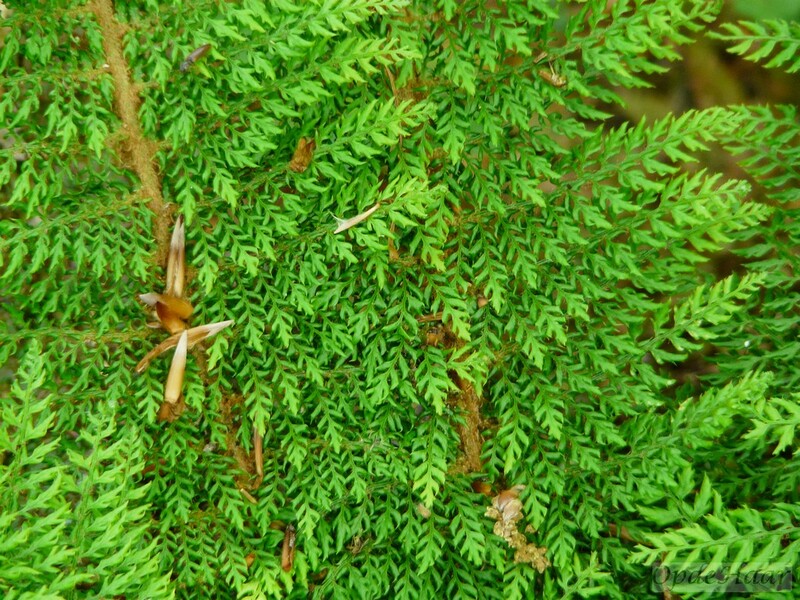 Polystichum species like rocky area in warm-temperate and mountainous tropical regions. Many ferns of this genus have stout, slowly creeping rootstocks that form a crown, with a vase-like ring of evergreen fronds 30 to 200cm long. 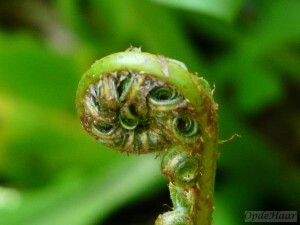 The sori are round, with a circular indusium. 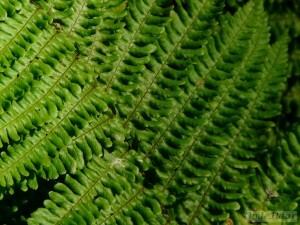 The stipes have prominent scales. 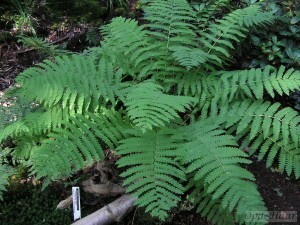 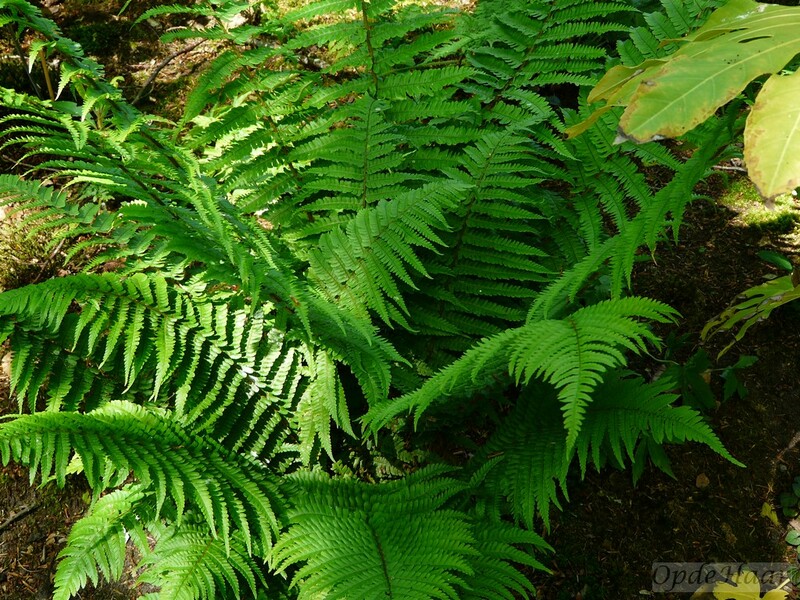 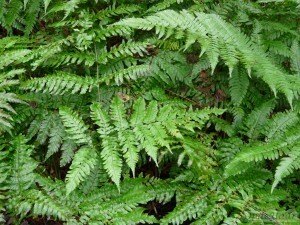 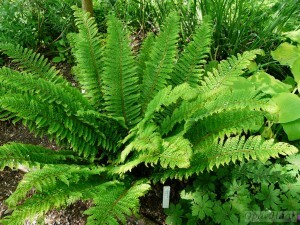 The genus differs from the closely related fern Dryopteris genus. 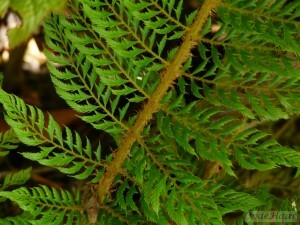 The indusium is circular, not kidney-shaped and the leaf blades have asymmetrical segments—one side of the segment is much longer than the other at the base. 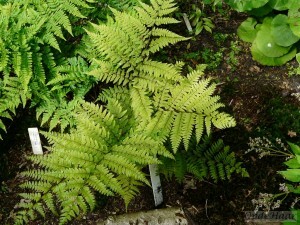 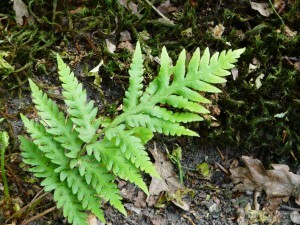 The leaves are also stiffer and rougher than those of Dryopteris. 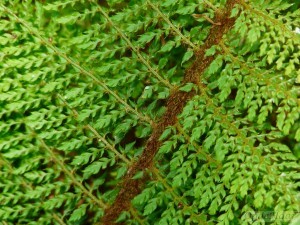 The sori are in one or more rows on the underside of the leaf. 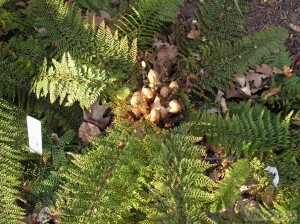 Polystichums frequently hybridise in areas where 2 sorts overlap and over 80 hybrids are known, although they are usually sterile. About 8 species occur naturally in Europe and in Belgium and The Netherlands there are 3 naturally occurring species: Polystichum aculeatum, Polystichum lonchitis and Polystichum setiferum. 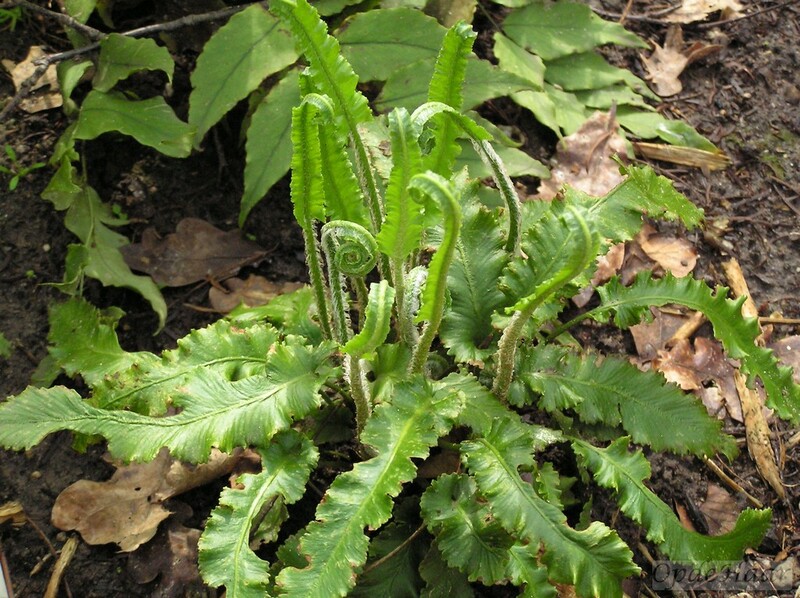 Matteuccia struthiopteris (common names ostrich fern, fiddlehead ferns or shuttlecock fern) is a crown-forming, colony-forming fern, occurring in temperate regions of the Northern Hemisphere in central and northern Europe, northern Asia, and northern North America. 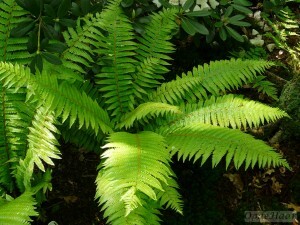 The species epithet struthiopteris comes from Ancient Greek words, struthio meaning ostrich and pterion meaning wing. It grows from a completely vertical crown, particularly on riverbanks and sandbars, but sends out lateral stolons to form new crowns. 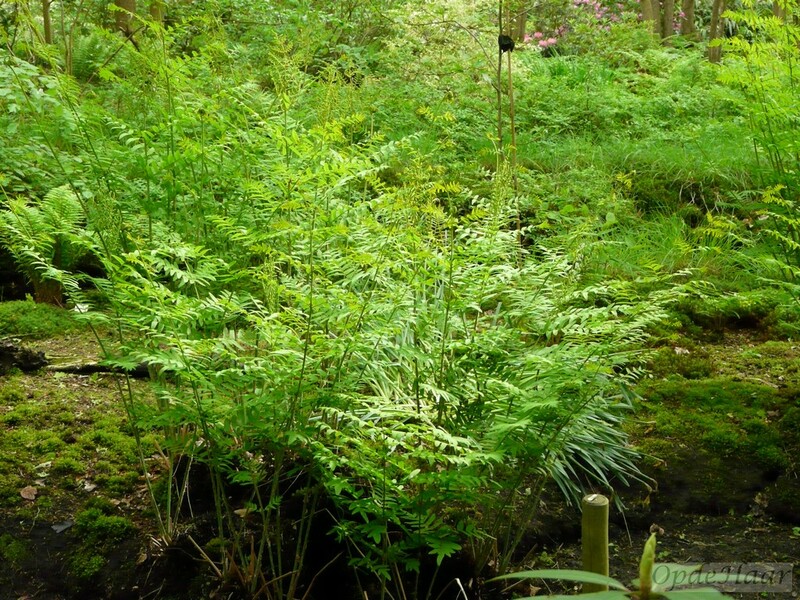 Dense colonies are therefore formed which are resistant to destruction by floodwaters. 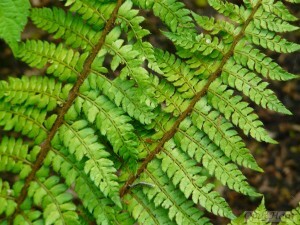 The fronds are dimorphic, with the deciduous green sterile fronds being almost vertical, 100–170 cm (39–67 in) tall and 20–35 cm (7.9–13.8 in) broad, long-tapering to the base but short-tapering to the tip, so that they resemble ostrich plumes, hence the name. 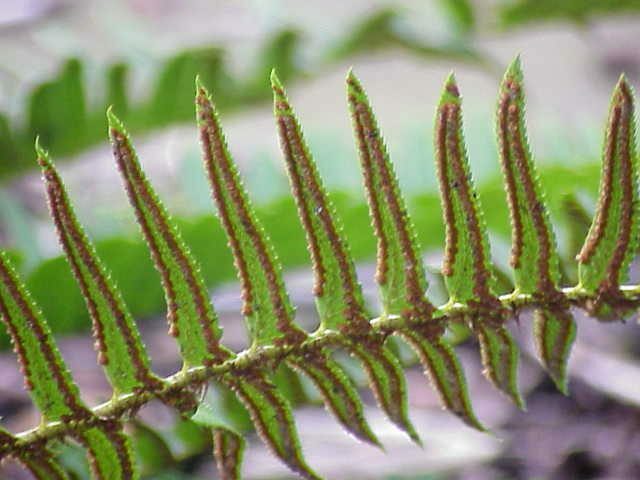 The fertile fronds are shorter, 40–60 cm (16–24 in) long, brown when ripe, with highly modified and constricted leaf tissue curled over the sporangia; they develop in autumn, persist erect over the winter and release the spores in early spring. 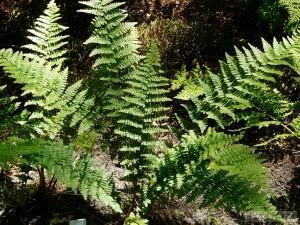 The ostrich fern is a popular ornamental plant in gardens. It has gained the Royal Horticultural Society’s Award of Garden Merit. While choosing a place of planting it should be taken into account that these ferns are very expansive and its leaves often lose their beauty throughout the summer, especially if not protected from wind and hail. 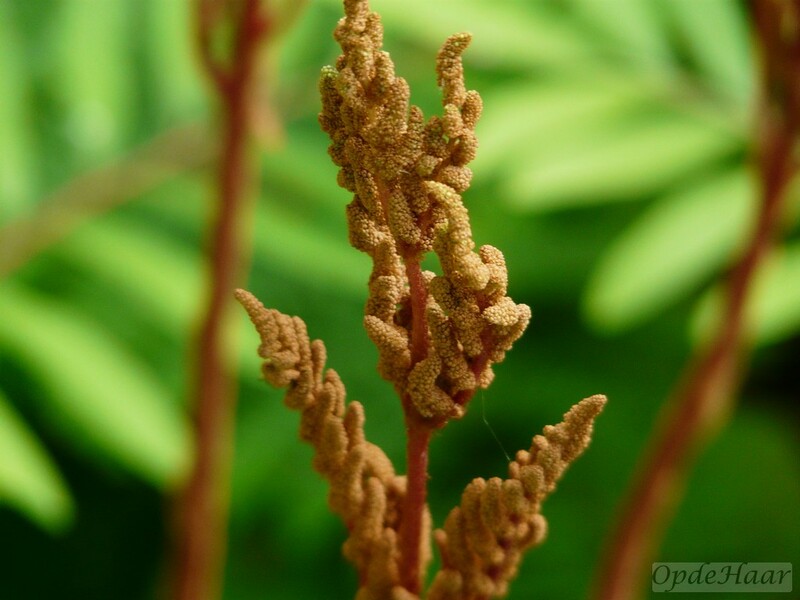 Osmunda lancea – vruchtbare blad met sporen. 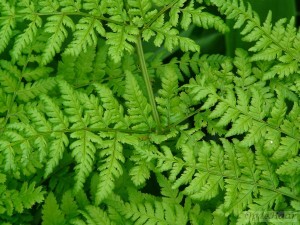 Osmunda is a genus of primarily temperate-zone ferns of the Osmundaceae family. 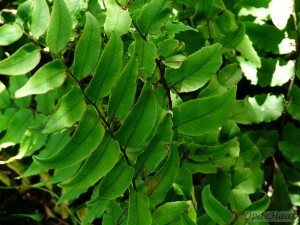 Five to ten species have been listed for this genus. 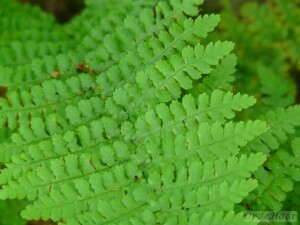 The species have completely dimorphic fronds or pinnae (hemidimorphic), large green photosynthetic sterile fronds (0.3 to 2 m long), and non-photosynthetic spore-bearing fertile pinnae, with large, naked sporangia. 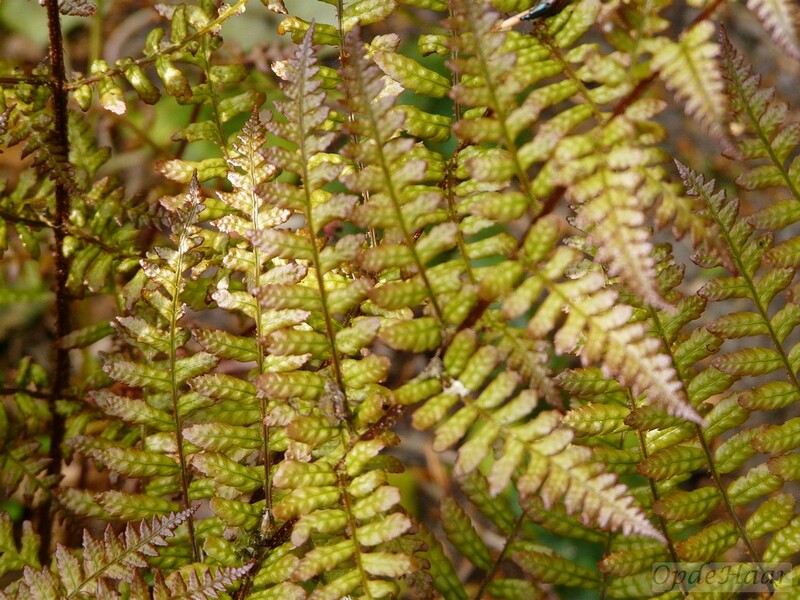 Because of the large mass of sporangia that ripen uniformly at the same time to a showy golden color, the ferns look as if they are in flower, and so this genus is sometimes called the “flowering ferns”. 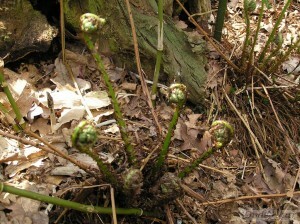 The spores are ripe in July and August. 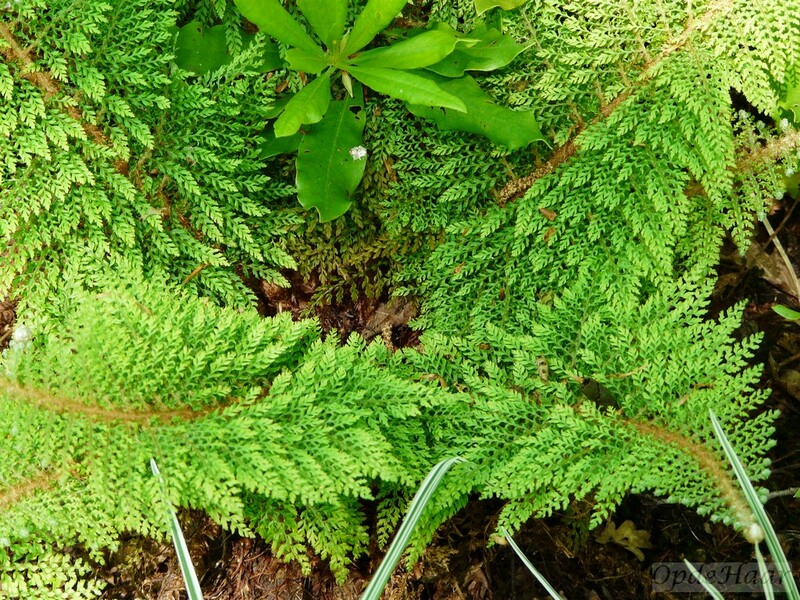 The plants can live for up to 100 years. 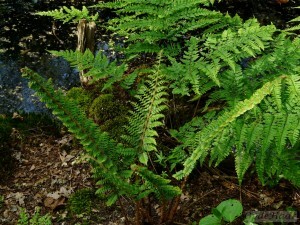 The genus is known in the fossil record back to the Triassic period from fragmentary foliage nearly identical to the living Osmunda claytoniana. 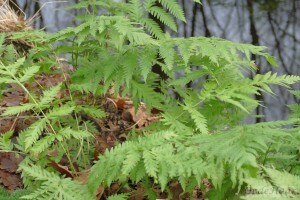 Paleontological evidence indicates that Osmunda claytoniana, a reputed “living fossil,” has maintained evolutionary stasis for at least 180 million years. 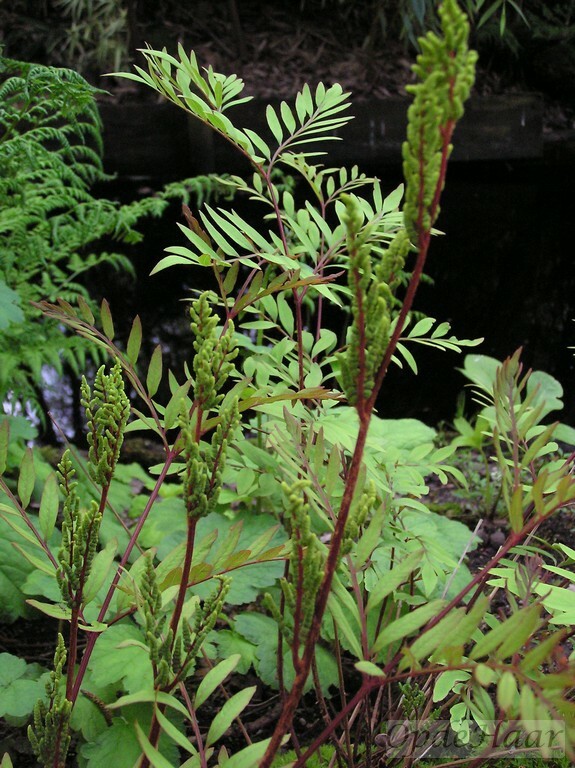 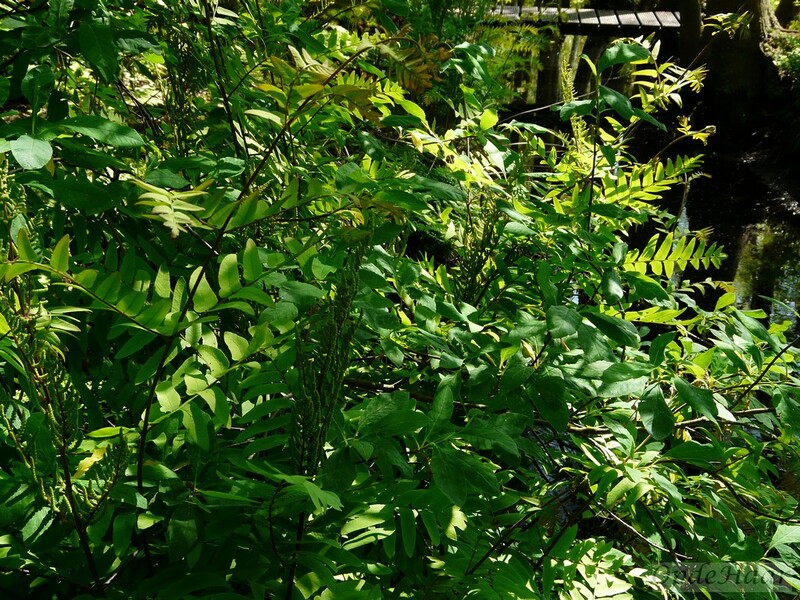 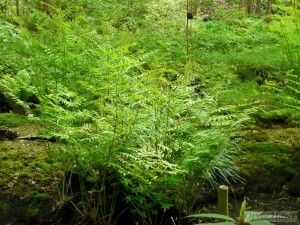 Osmunda regalis occurs naturally in moist deciduous woods and on the sides of ditches. 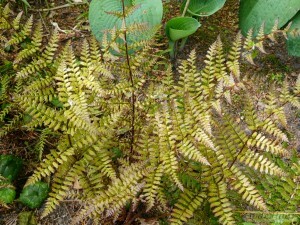 In other areas it is is quite rare. It is native to our garden and seeds itself profusely along the sides of the ditches. 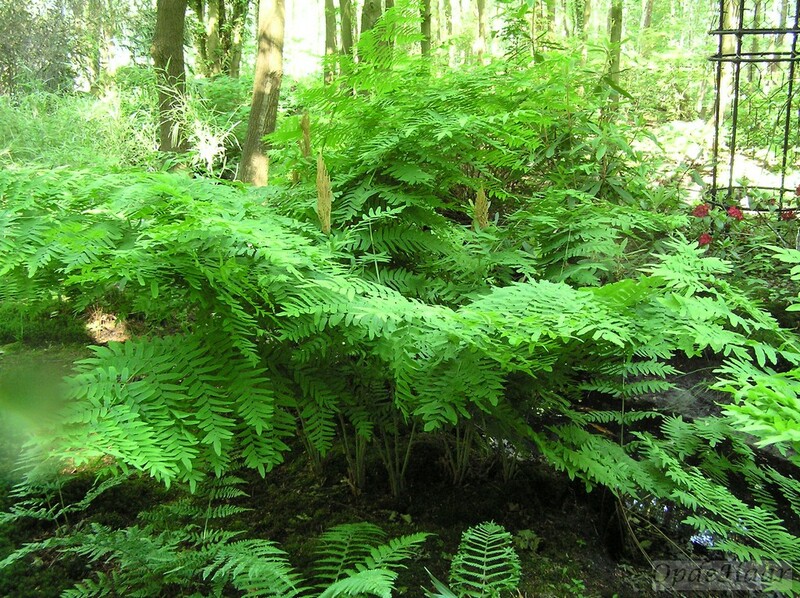 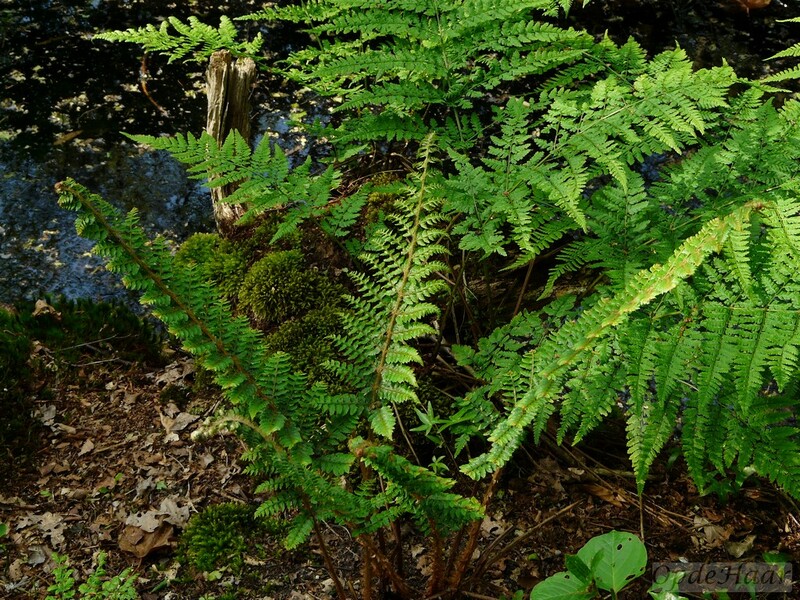 It is the largest native fern in the Netherlands and was protected, as it is relatively rare. However since 1st January 2017 the protection has been removed. 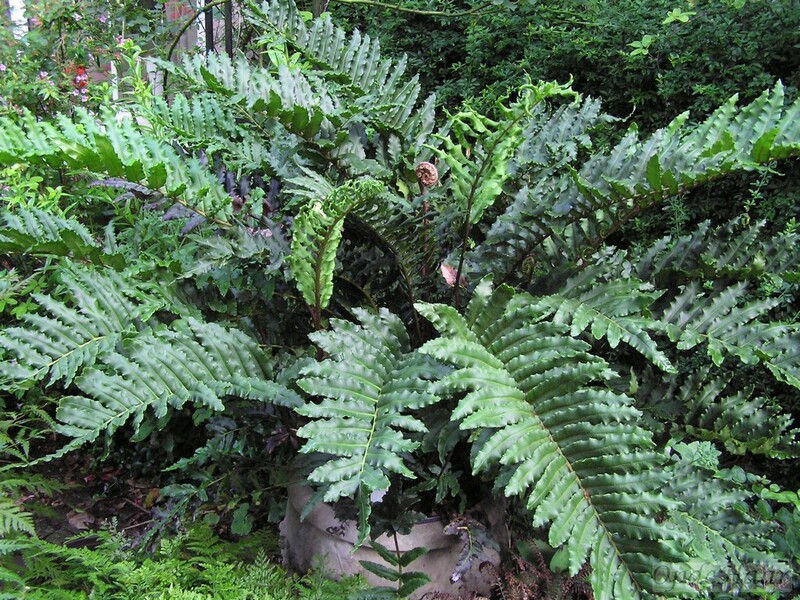 When only two people are looking after a large garden, every plant which is put into a pot represents a small but collectively extra burden in terms of the daily attention required etc. Accordingly, we don’t have hanging baskets and you won’t find many annuals in our borders. 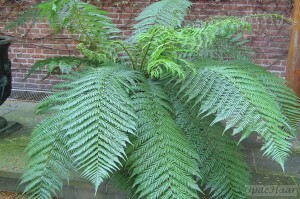 However, pots of plants, which need greenhouse protection in winter, are distributed around the house and these include some spectacular but tender ferns. On the northern side of the house by our front door are two Dicksonia antartica tree ferns. These are frost tolerant but they do need special protection to avoid rotting in the crowns in the winter months so it is easiest to put them under cover. 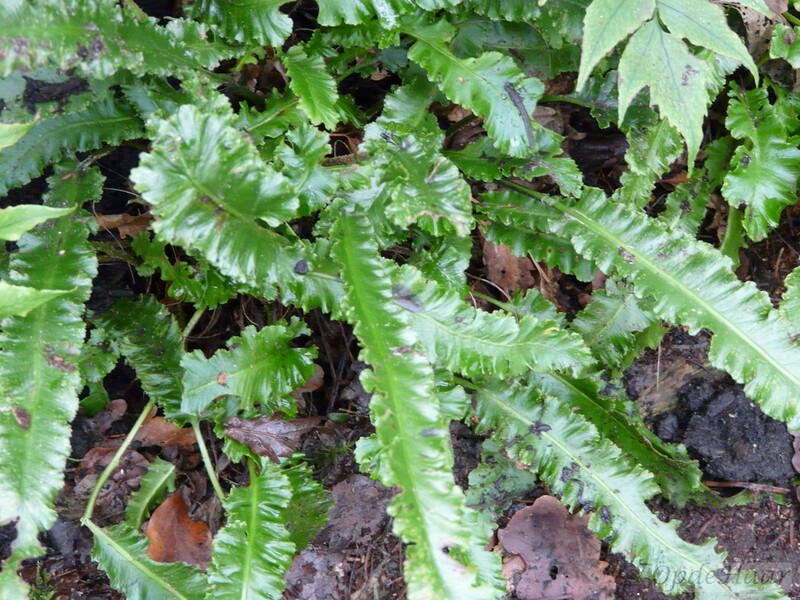 Coming around the south side of the house, you will find a lovely specimen of Blechnum tabulare; or is it Blechnum chilense? It is probably the latter and time will confirm this if it starts to form a small trunk on its older parts. 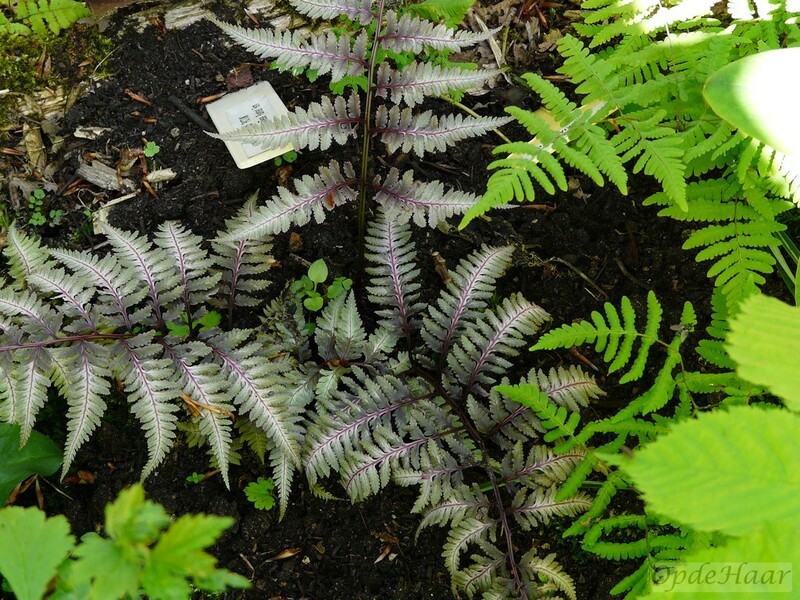 It started life as far as I am concerned as a matchbox-sized plant which was clearly trodden upon in the famous Dereen woodland garden in the south of Ireland and it looked interesting to my eye. 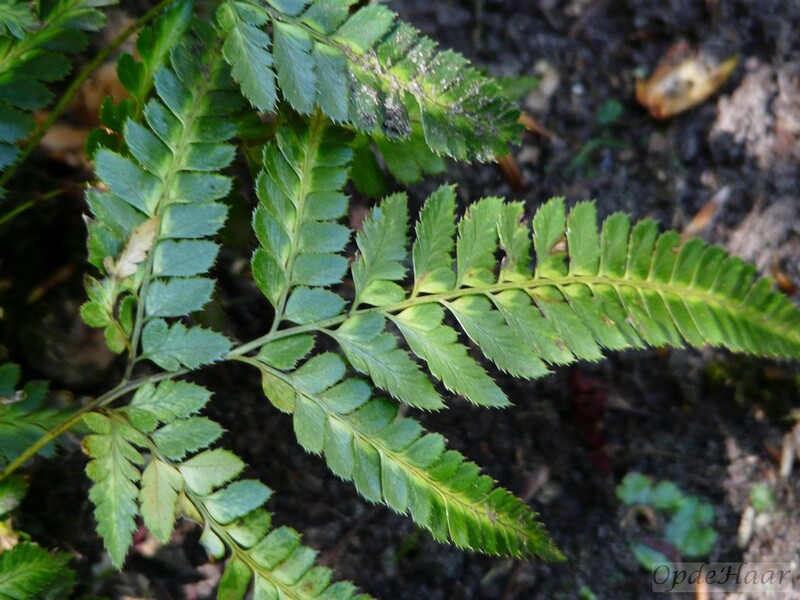 Also in this area you will find Woodwardia unigemmata from the Himalayas – I found this as a tiny plant in Spinner’s Garden near Bournemouth (UK) in 2003. 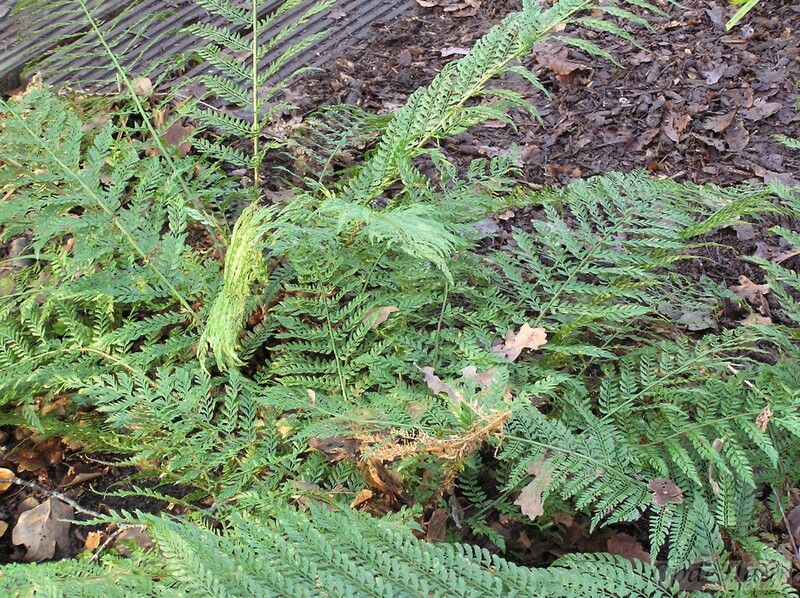 Both the blechnum and woodwardia are candidates for planting in a protected position in the woods with winter protection, but I won’t chance this until I have propagated from them. . 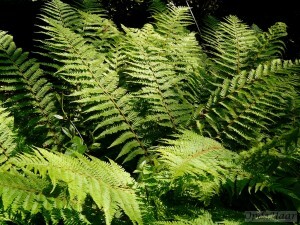 Finally just a note to say that we do not get any commission for this hero worship either!